i am truly glad that i went to parliament house with a good friend in the wee hours of 26.3.2015 to pay respects to Mr Lee Kuan Yew. i am very proud to be a singaporean, to witness & be part of the spontaneous outpouring of grief & gratitude for such a great man who devoted his entire life to singapore, to us. i am very happy that i teared & wept many times over the week of mourning like many singaporeans who also found love & gratitude in their hearts & poured out their feelings unreservedly. (quote) Mostly, we are impressed beyond words, by our fellow countrymen who came and bond together, and the unspoken heroes who provided drinks, cakes, bread, flowers and more along the queues. We are amazed by the quiet queues that just kept forming, and the quiet resilience displayed through a simple action like this. We are impressed by the seemingly seamless arrangements made by the authorities, and the amount of work and sleepless nights for those on duty. We are touched by the love, care, respect and the wonderful “Singapore Spirit” displayed by Singaporeans, in this difficult time. A spirit we never really knew existed until now. We did not practise this, nor did we choreograph this. It is just so simply…Singapore. We have always been searching and asking about the Singaporean identity. This is it. Fifty years ago, a man brought us together as one united people. Fifty years later, he brought us together again, and we stand united as a nation. 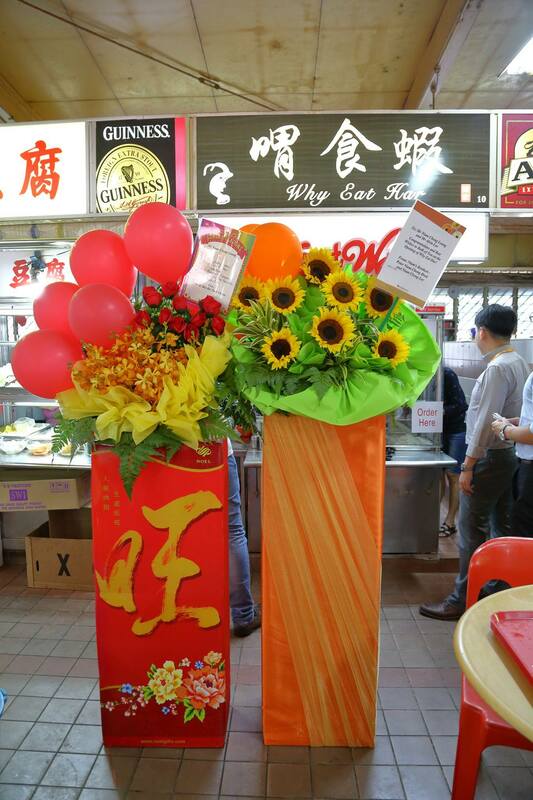 as yvonne (who i do not know) famously described, this is the last contribution by Mr Lee to Singapore. even in death, he has united the whole nation & helped us unlock the deep feelings, purpose & resolve for the country. this morning, my wife, my daughter & i were at the clementi community tribute site & i managed to pay my last respects to Mr Lee Kuan Yew. 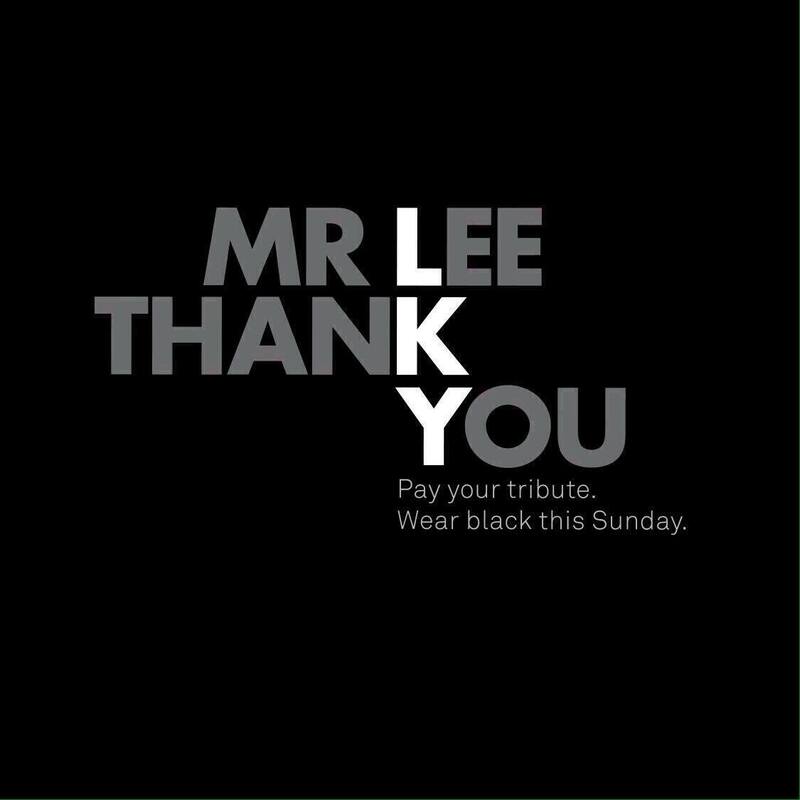 Rest in Peace Mr Lee. as PM Lee Hsien Loong said, you were the guiding light for the nation, and your values & ethos will continue to inspire us & be our guiding light. Cherian George – Singapore please listen to him! Cherian George…you are my new idol! NTU don’t know what they missed that such an outstanding person as yourself could be denied tenure & have to find employment in HK..
PAP leaders should seriously listen to you! such fairness, moderation, balance, intellectual honesty & calm & incisiveness! agree with & learn from everything you said, in particular LKY’s incorruptibility & how Singapore is so lucky to have him! i had expected a very professional analysis but with the usual fashionable western liberal emphasis on mr lee’s intolerance towards alternative views. after all cherian george does have some very recent legitimate grievances with NTU denying tenure. it is NTU’s & Singapore’s great loss that the man is now plying his trade in hong kong. instead his depth & incisiveness demonstrated true intellectual honesty, moderation & balance in examining the issues and also genuine care for singapore’s future. it is a fair & balanced mind with respect for the truth (& equal respect for other human beings with difference of opinions) that is constantly considering, weighing alternative viewpoints & angles, & new facts & information. cherian spoke as he believed. his was not some shallow piece beautifully crafted to appear to be balanced & fair in order to look good or to impress, which i see often these days circulated on the social media. i liked his observation that mr lee was in fact more liberal & ahead of the curve than the present PAP leadership, that it is in fact the present leadership that is dogmatic clinging to past formulas of success rather than working from basic pragmatic principles of service & what’s good for singapore. in contrast, the founding fathers under the leadership of mr lee had been truly pragmatic, serving & delivering what was good & what worked for singapore & not constrained by dogma & ideology. cherian’s humanity & generosity of heart really resonate with me. mr lee & his generation of leaders were pragmatic because they cared so much about the well being of the people of singapore. last night, i went with a good friend & started queueing for almost 2hrs from 2.35am to 4.30am to pay respects to our beloved first prime minister Mr Lee Kuan Yew. Standing in queue at padang at 2.46am… about 2hr queue? 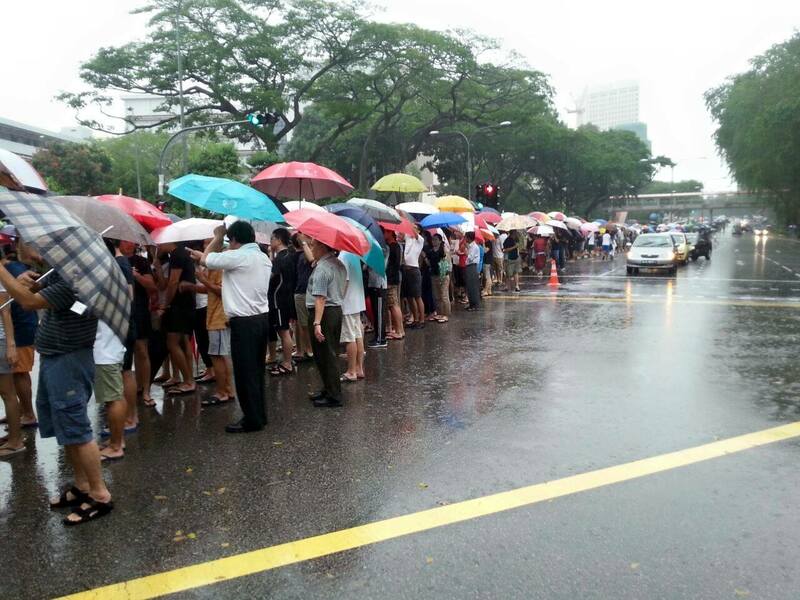 Really proud of my fellow Singaporeans standing in queue to pay respects. That so many understand gratitude & respect. .
You cared so much for us. Did so much for us. 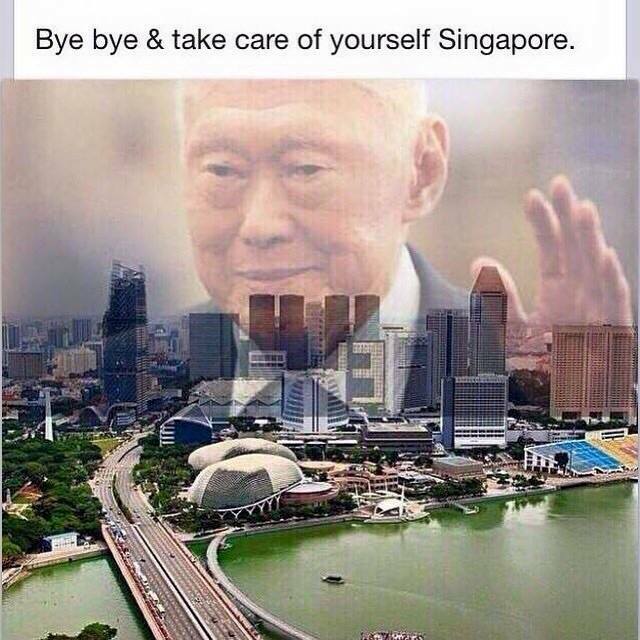 devoted your entire life to Singapore. It is so very sad that such a great & wonderful person like you is no more..
my feelings were no different with so many singaporeans from all walks of life who said that waiting in line for whatever number of hours was the least they could do for Mr Lee who had given his entire life to singapore & made our lives immeasurably better! 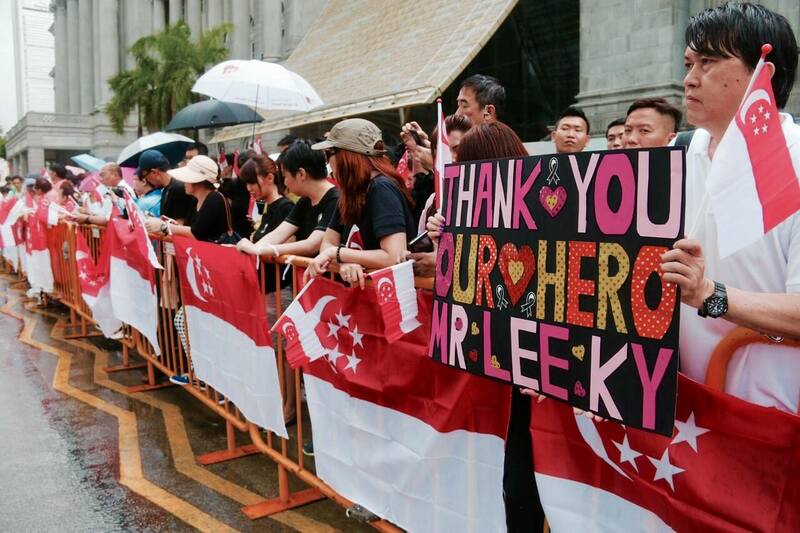 my friend & i were really happy that we came to be part of this spontaneous outpouring of grief & gratitude for mr lee. there were endless accolades from world leaders. i liked the tribute by henry kissinger especially. both the new zealand parliament & australian parliament passed tribute motions & had many tribute speeches by leader of various parties. singapore also had a special session of parliament with many moving tributes from minsters, PAP MPs, mr low thia khiang, leader of the opposition workers party, and NMPs. i was very moved that sylvia lim chairman of workers’ party (and like everyone else) were in tears. genuine emotions are to be treasured. i never thought i would tear myself. 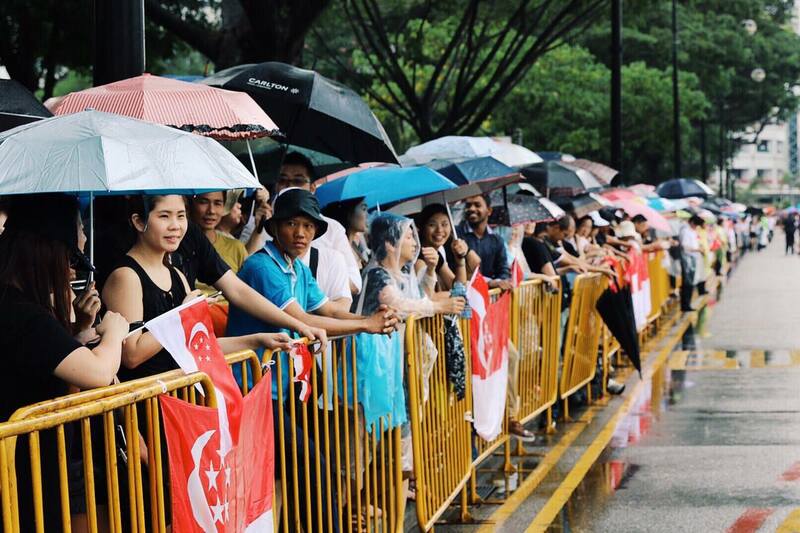 but listening to the speeches & tributes, and what ordinary singaporeans said & the open display of emotions, i am very happy that i cried just like anyone else. today i watched the rappler interview with cherian george, a singaporean writer and academic based in hong kong, to assess Lee Kuan Yew’s legacy and to take a peek at what’s ahead for singapore. he was just so good! 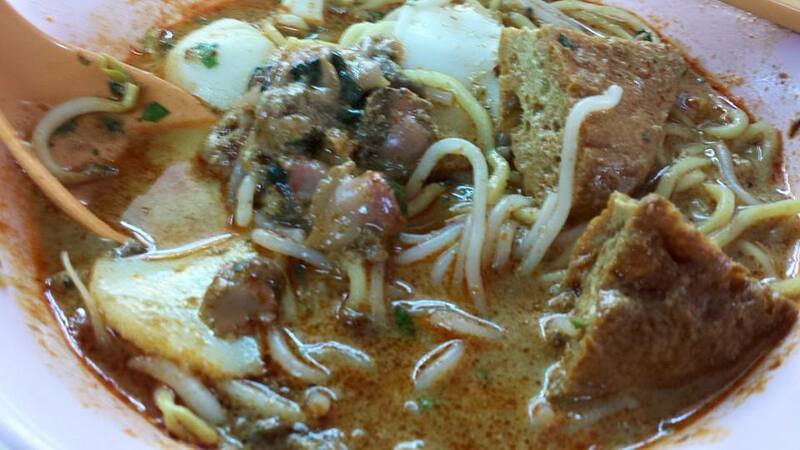 had been trying out laksa at different places last few days. i was there at 11.55am but there was already a queue of 15 people. the queue went plus minus a bit but when i finished at 12.30pm queue was just as long. so many people cannot be wrong, can it? i queued for 25minutes. 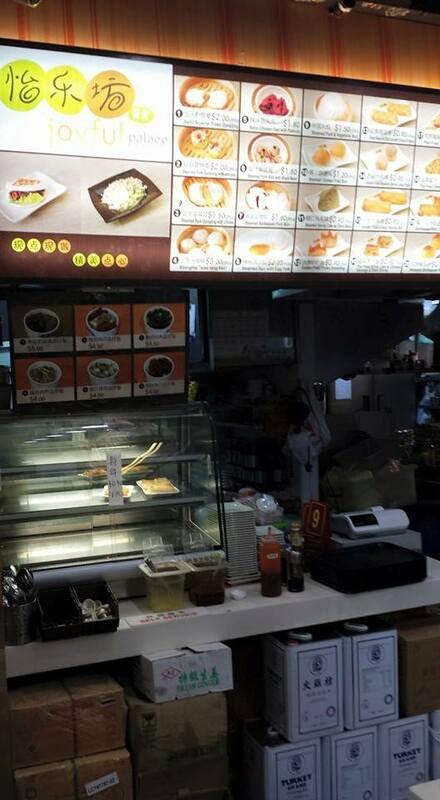 weiyi had a good system with a board with numbers for the combination to order & the prices. & the guy was friendly, knew how to smile & be happy, which was sometimes lacking in other sellers. 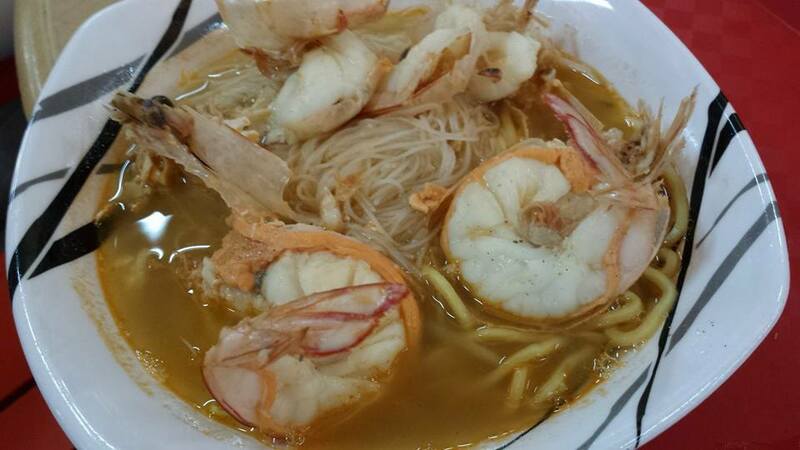 weiyi also sells prawn noodles. today there was a sign “sold out” (at 12pm??). anyway i came for the laksa. 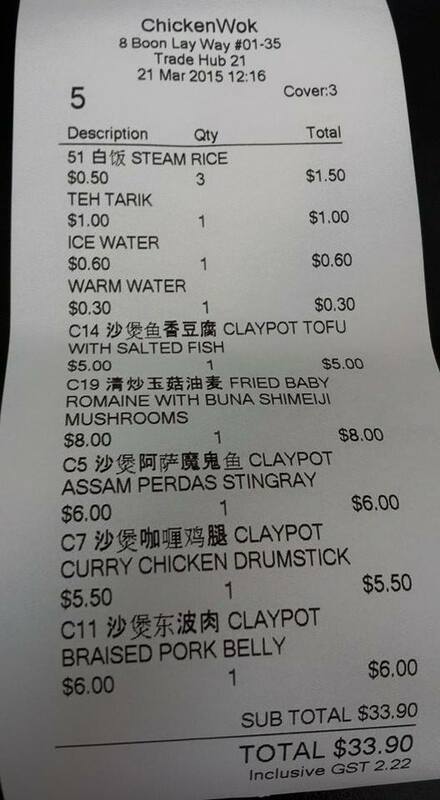 there wasn’t a number combination with just cockles & taupok. 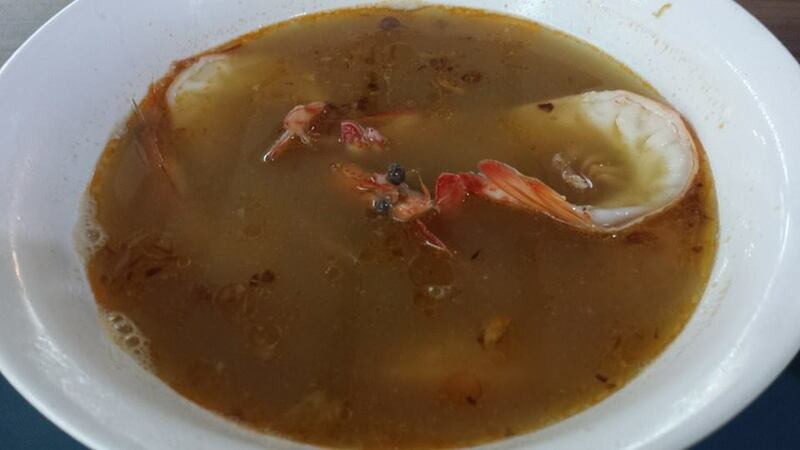 there was no purpose for me to try prawn combination. chicken with laksa was most uncommon so i wanted to try it. 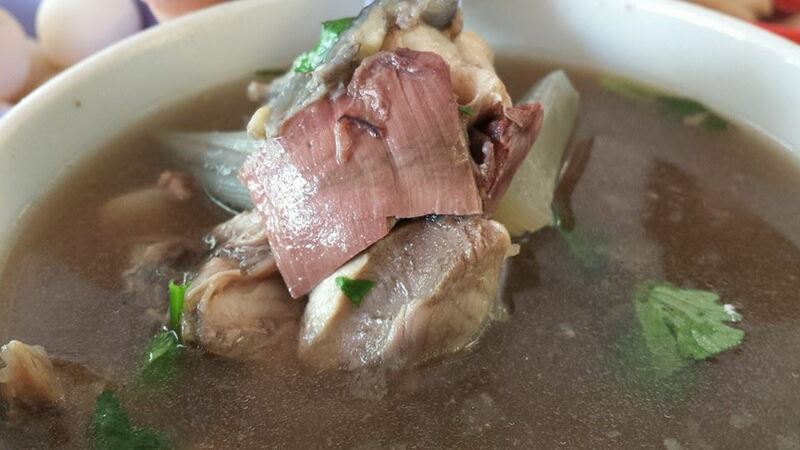 cockles were fresh & plump, taupok was soft & well infused with gravy & not falling apart. chicken was a lot better than i expected, very sweet & tender. but of course, however good the chicken might be, it was no comparison with the poached chicken白斩鸡 at ah heng curry chicken noodle at hong lim food centre. 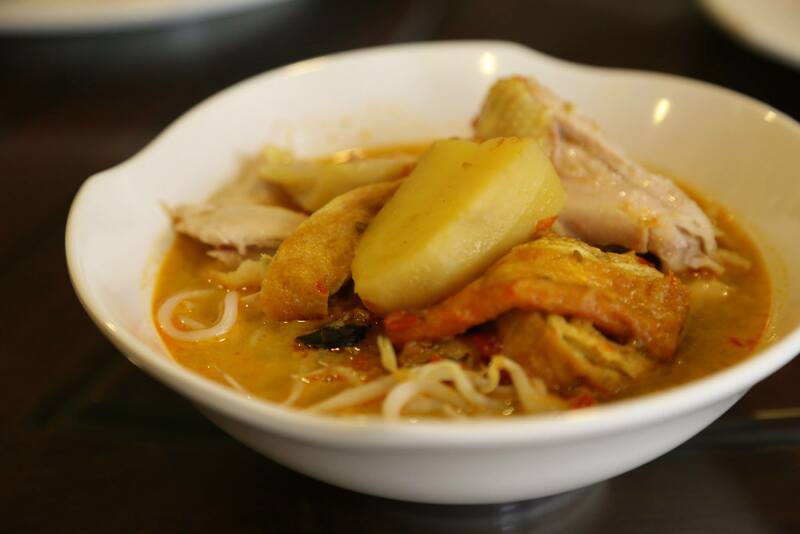 likewise for heng kee curry chicken noodles. 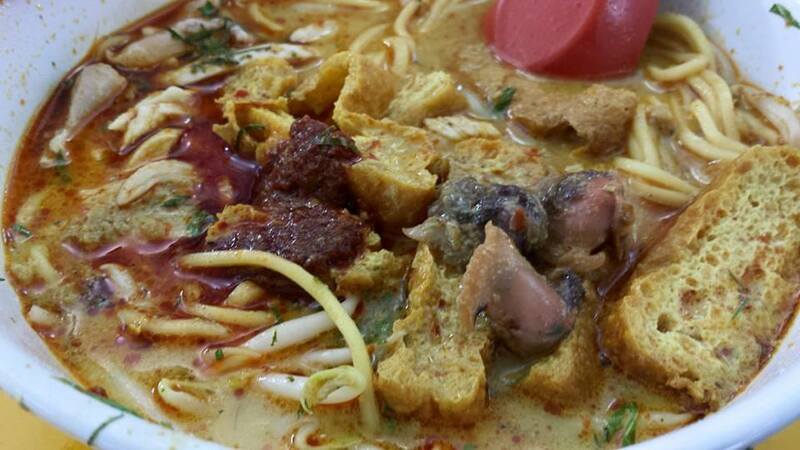 just comparing laksa with laksa, this would beat the #02-141 stall at bukit timah food centre hands down. 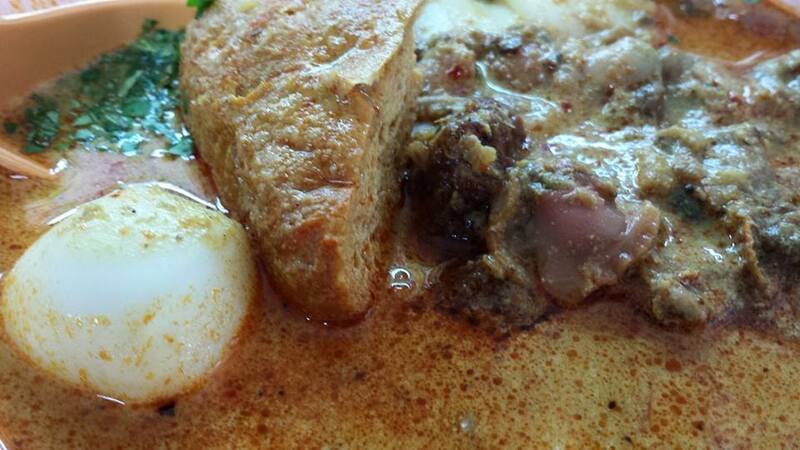 & compared with sungei road laksa at jalan shui kopitiam at jalan berseh? it’s kind of difficult to compare. 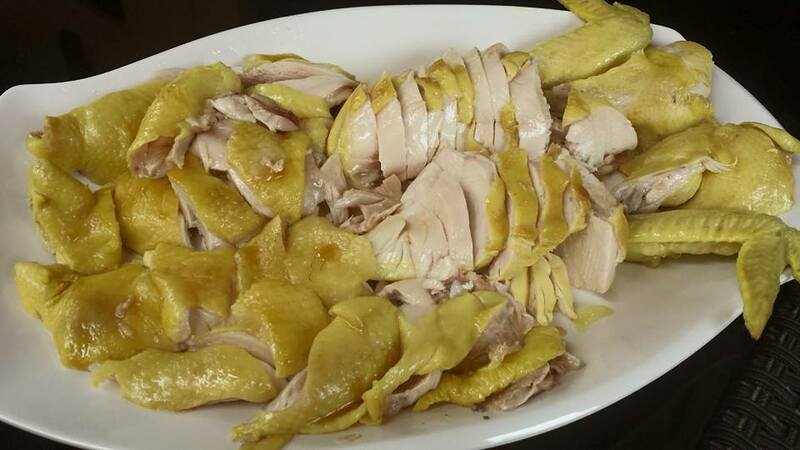 this weiyi version, like teck hin’s, was a lot more savoury & substantial. 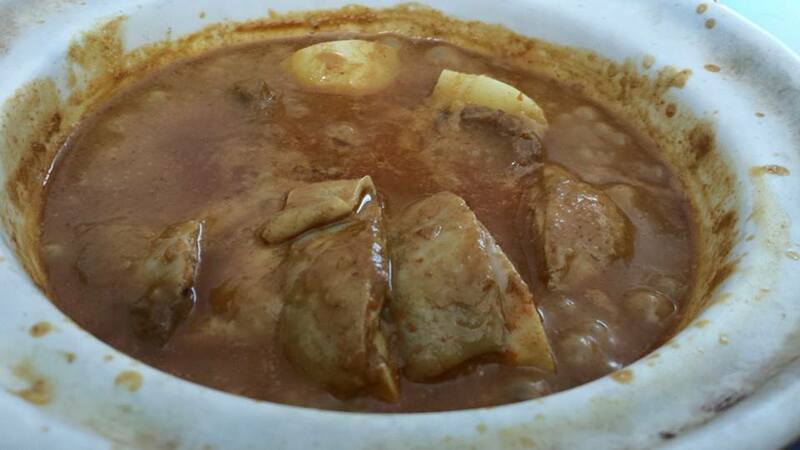 sungei road had more lemak & sweet gravy. it was 3.30pm. carpark was empty & many stalls were closed. 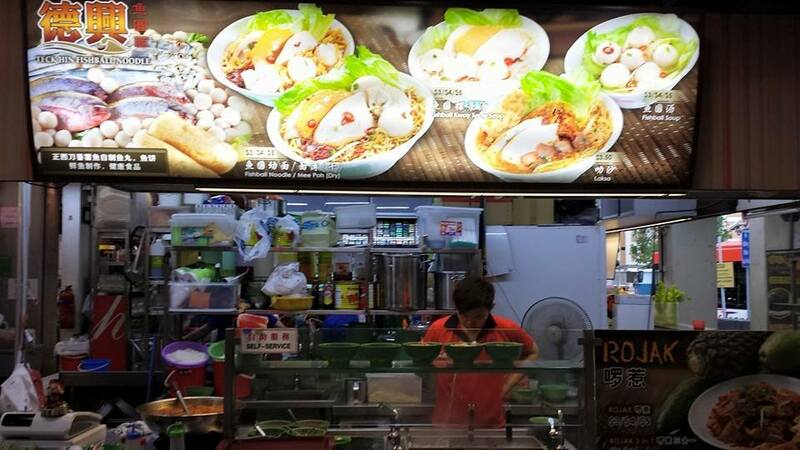 last time i came here was with a group of friends on our own hawker food tour in 2013.
saw this stall #2-141 & the photo of laksa looked great, so decided to try it. the laksa that came did not look quite as good. i added S$1 “hum” i.e. cockles so it was S$4. cockles were good, fishball & fishcake ok, taupok was ok.
the laksa gravy was a bit too pasty. it did have a lot of haebee was flavour was ok.
by comparison, the laksa at teck hin fishball noodles at food loft @ clementi was distinctly better than this. 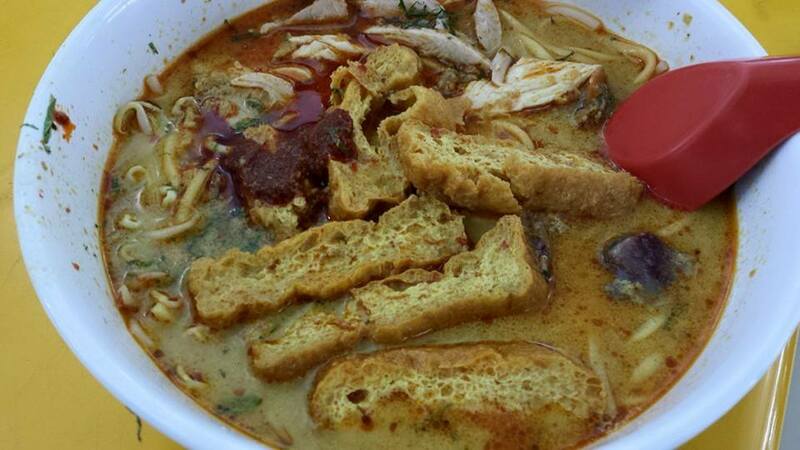 this laksa was not too bad really. but it is probably a standard of laksa you can get anywhere, and many places also better than this, so it was just ok, passable. went to visit a chinese friend & look at his new Beacon LED office/store at tradehub21 on 21.3.2015.
we were early (intentionally) at 11.15am so the place was empty & we were the first & only customer (at the time we finished about 12pm). we ordered 5 dishes. 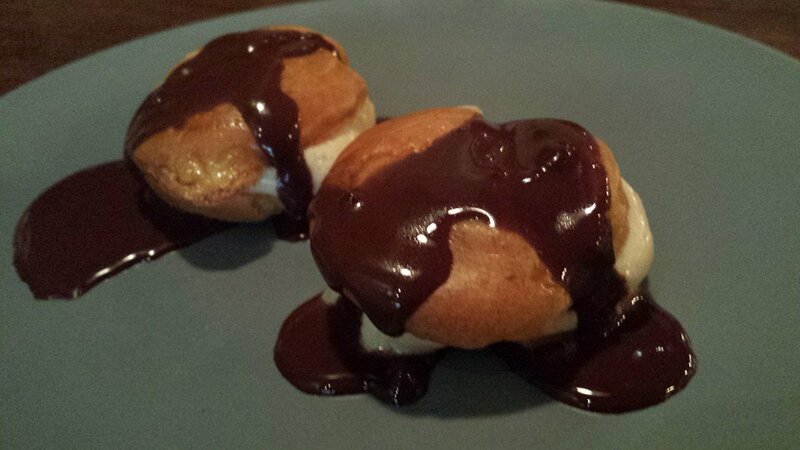 they were all pretty ok, no bad dishes, tasty enough, quite inexpensive. 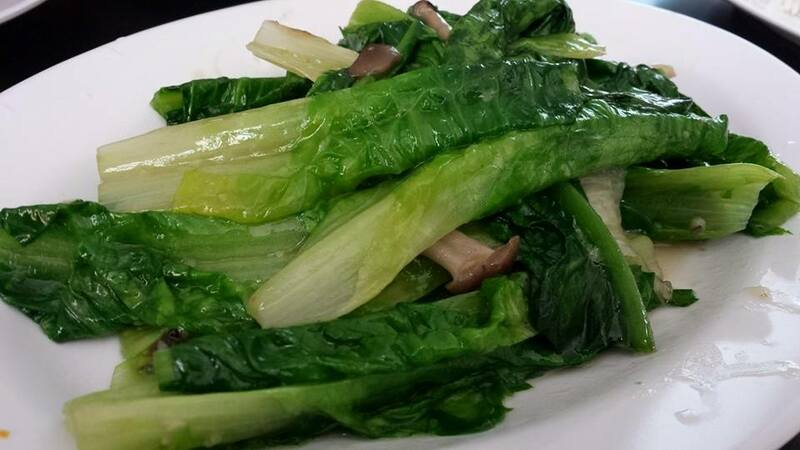 and i do marketing, so i know the average amount romaine lettuce cost S$2.50 (2 bunches) to S$3.50 (3 bunches) in sheng shiong, and more in chinatown. well, so it’s S$8 in an inexpensive restaurant. 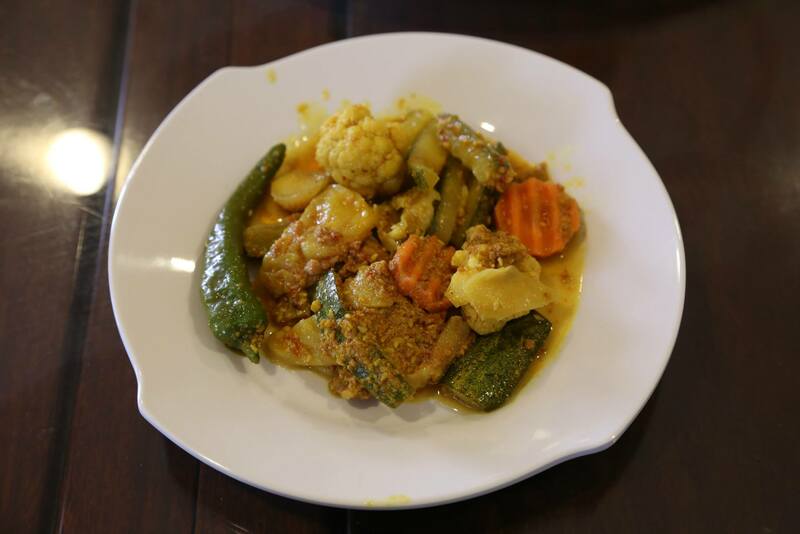 this the thicker more pasty curry & not so lemak kind. my interest was piqued by the saw a write-up on ST Life on enochximmanuel 6-course dinner menu 3-day event. i did not managed that but did went with my wife to enoch’s the evening before. so today, it’s time to try out immanuel french kitchen. it’s not easy to get parking even at 11.45am. anyhow i managed to parked at SCAL (singapore contractors association limited) building. salute coffeeshop is really an interesting concept. all the stallholders are “boutique restaurants” in a non-air con environment. the “people in white” wearing the stew kuche tees seemed to be policing the place. i was early & place was quite empty so i sat at a 4-seat table. they asked me to move to the next 2-seat table. reasonable ask, good practice i guess – so comply, not that there was a choice! they did that to a young couple again who came to sit at the table i vacated. well, at least it was consistent & diligent. we came mainly for immanuel french kitchen. chef immanuel tee has rather illustrious pedigree, having worked at jaan with chef andre chiang, restaurant andre (where he met & worked with chef enoch teo), michelin starred guy savoy & pastorale, & keystone. young chef was busy. there were another 3 helpers. 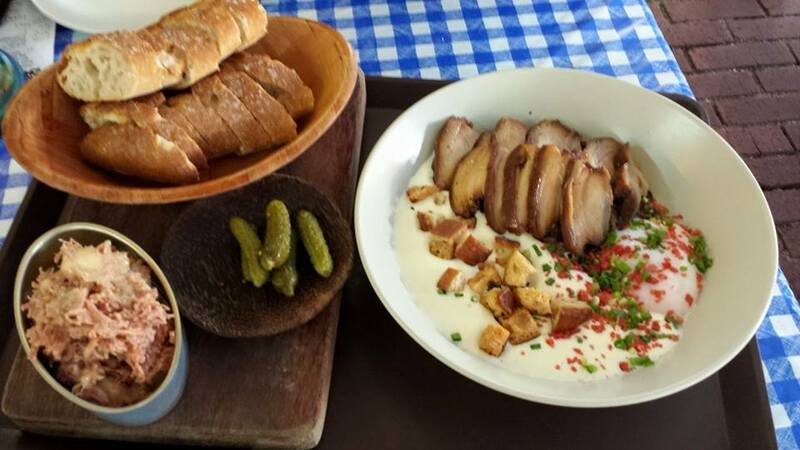 we ordered the duck rillette & the kakuni style braised belly pork. both were good! 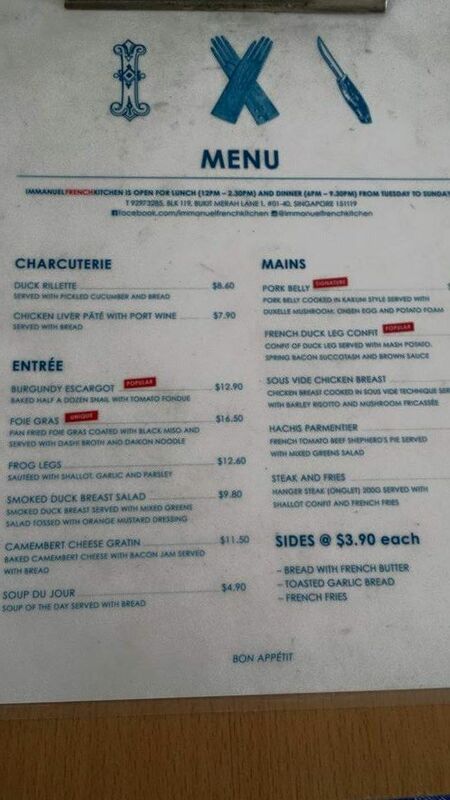 i love the duck rillette. 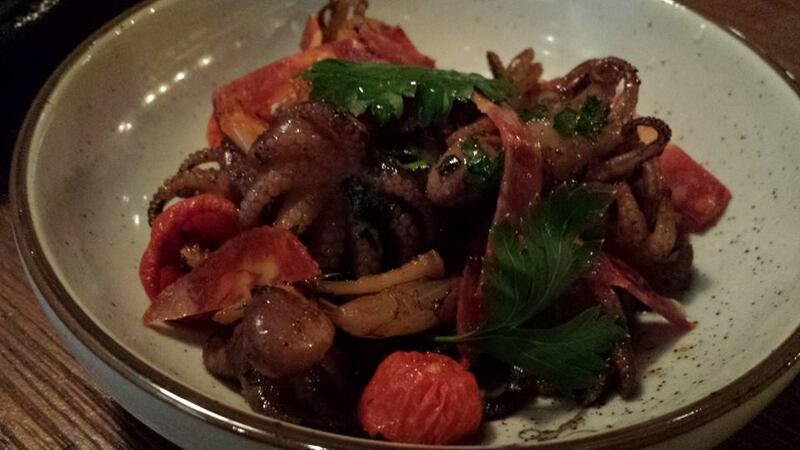 it was a very good helping too, & served with pickled gerkhins, which i liked too. 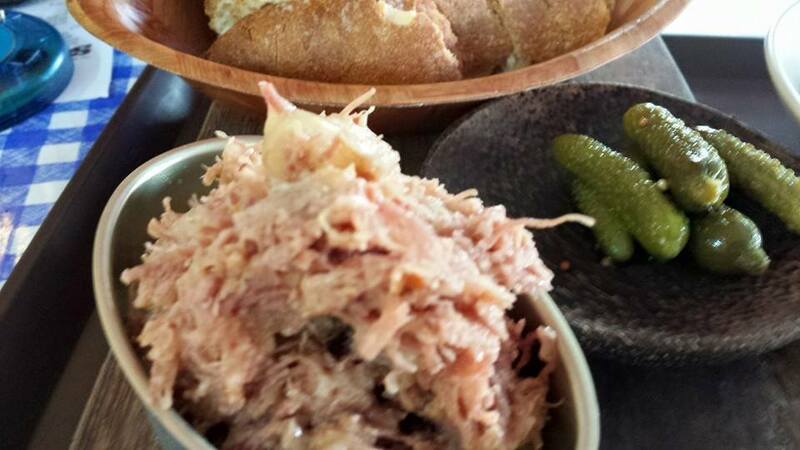 the baguette was good too & excellent taken together with the duck rillette. i want to eat this again! the stew ruche menu did not look exciting. 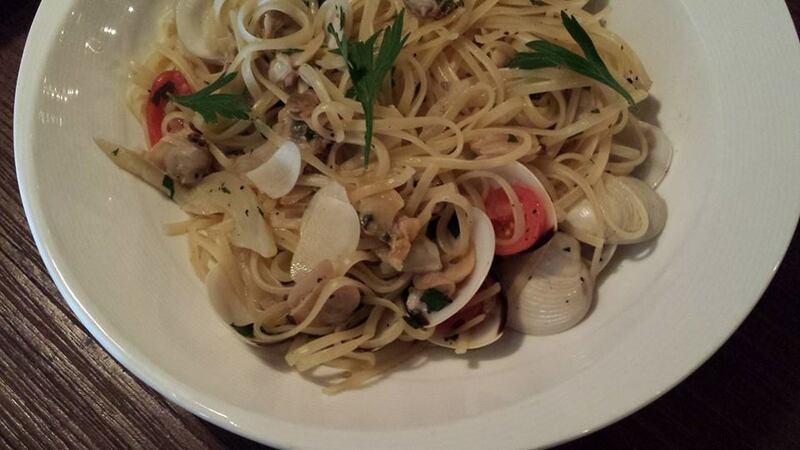 we were not going to take the knuckles, & the pasta did not look great. 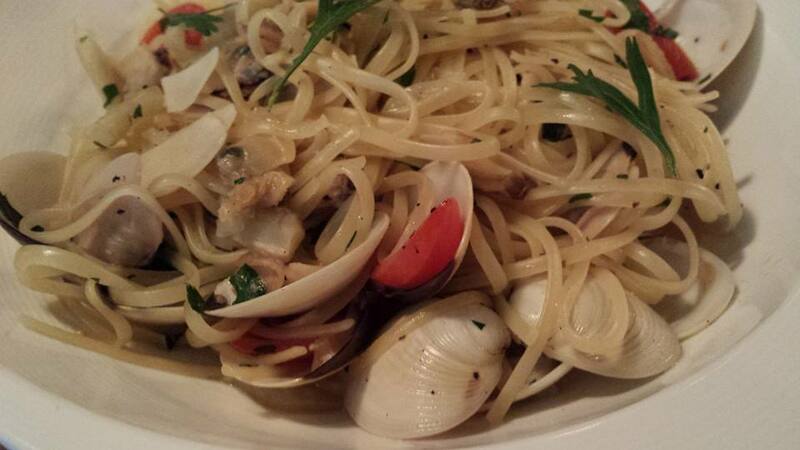 of course could not tell until you tasted it but on photos alone, think my own pastas are better than any of them. 1 reviewer commented that the ramen burger had nice bulgogi but the burger tasted like maggi instant noodles snack! 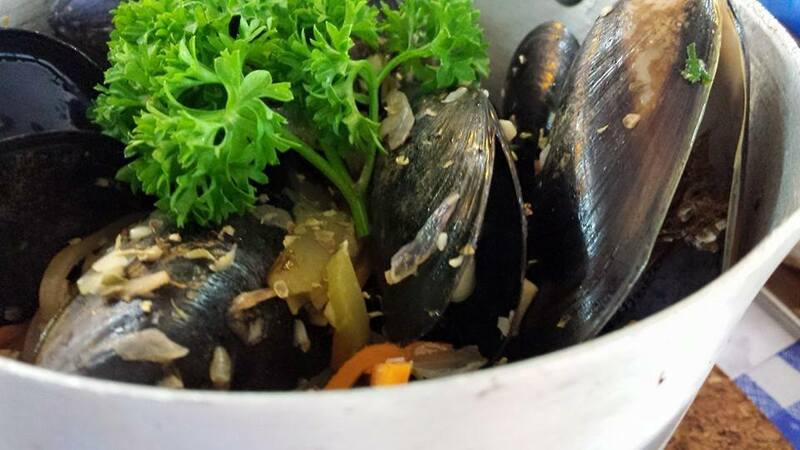 my friend decided to try the mussels pot from seasalt. this was poor really! & such a simple dish to make. 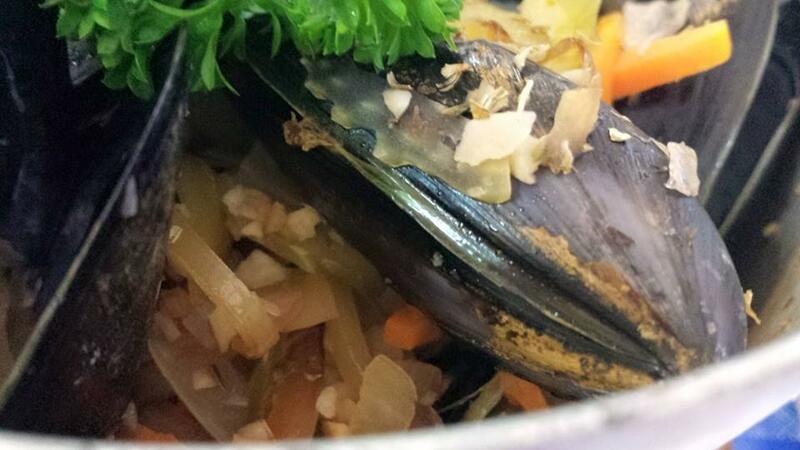 mussels were just slightly overcooked & not so juicy & succulent. the sauce gravy was ordinary. 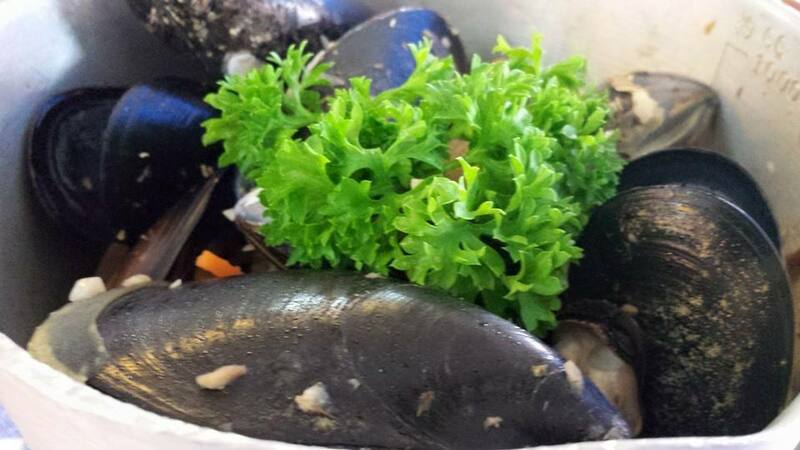 worse, 1/2 the mussels had beards that were not removed, quite “dirty” really. no chance i would try this again. 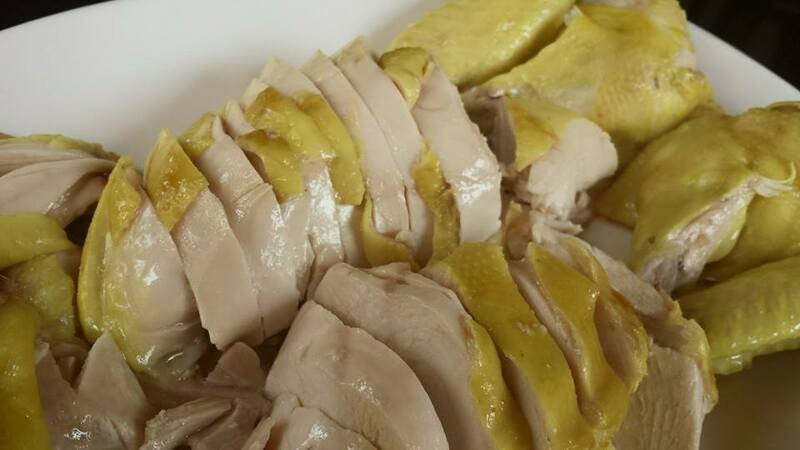 been doing poached chicken白斩鸡 quite a bit, most recently for a 9pax homecooked lunch on 9.3.2015. 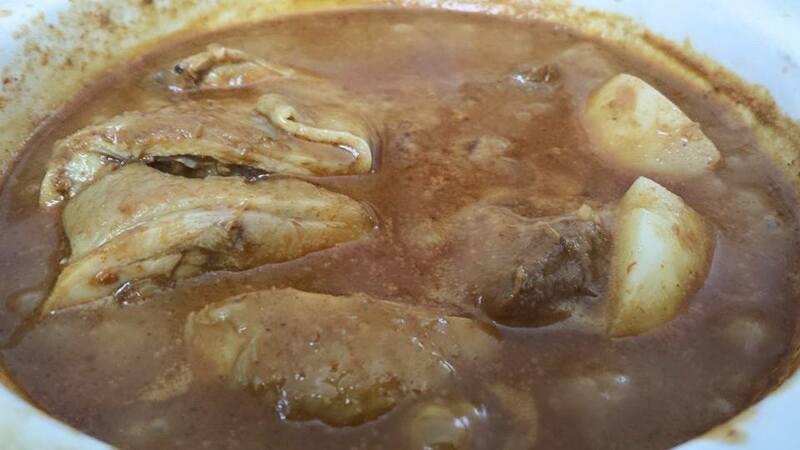 1 of the delectable dishes i made was “hong lim FC curry chicken noodles”. 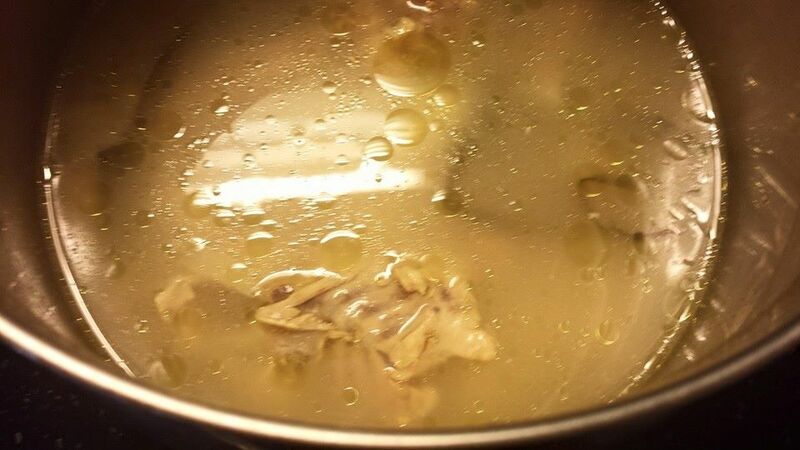 basically i used the same method to make the poached chicken白斩鸡, just that the chicken stock needed to be more intense to produce a tasty chicken curry gravy. though i have made the poached chicken白斩鸡 many a times, i had not gotten around to making the chilli sauce & the rice. 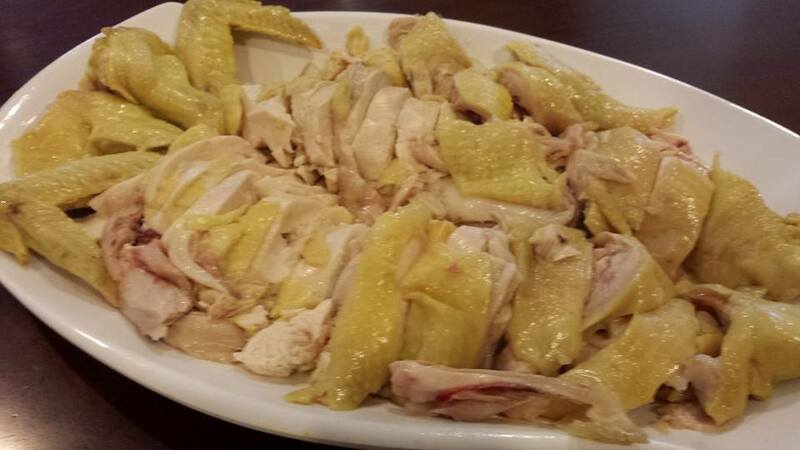 recently my son in london shared on family whatsapp the chicken rice he made for his friends. that finally got me to try out my own chicken rice. 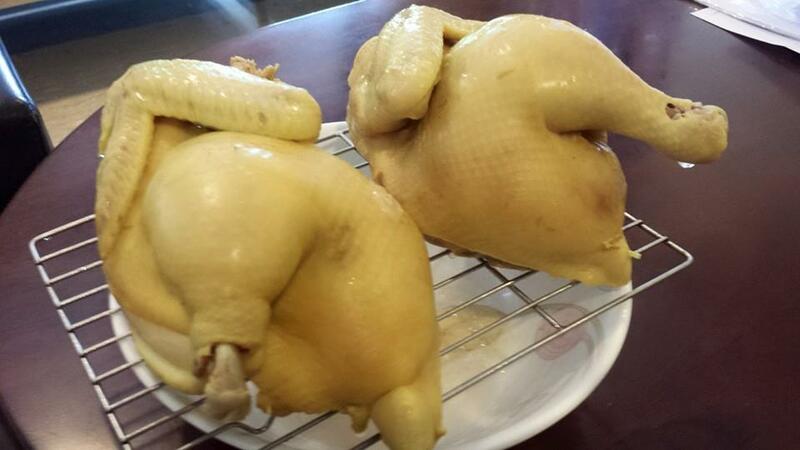 so i followed my trusted poached chicken白斩鸡 recipe & made another tasty, moist, tender chicken. this was my very first time though to attempt the chicken rice. after i deboned the chicken, i put pack the bones to the stock & boiled for another 2 hrs, reducing to a very flavourful chicken stock. 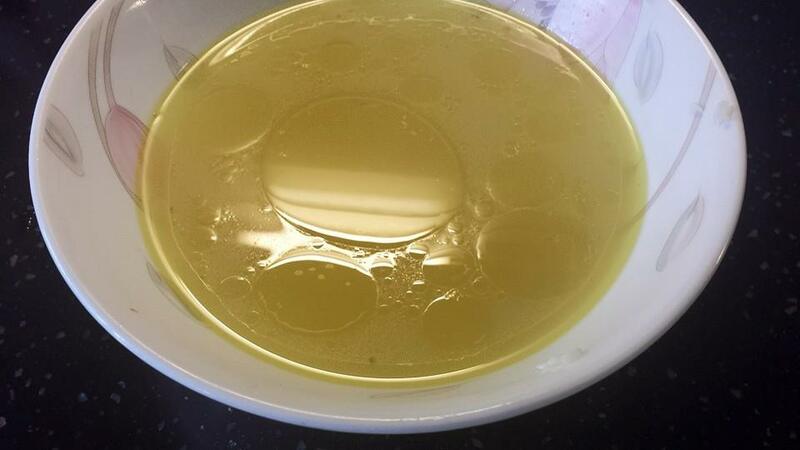 i was cooking 2 cups of rice so took out 2 cups of chicken stock to cool down. 1 browned 3 chopped shallots, then added 2 teaspoon minced garlic & slice ginger (3cm piece) & fry for short time to get the fragrance aroma, then i added the 2 cups of rice and mixed thoroughly. 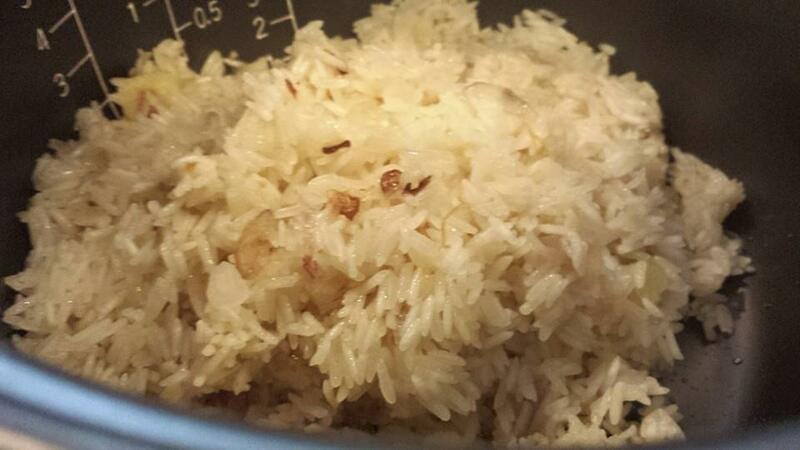 i removed rice & put in the rice cooker & wait for the stock & rice to cool. 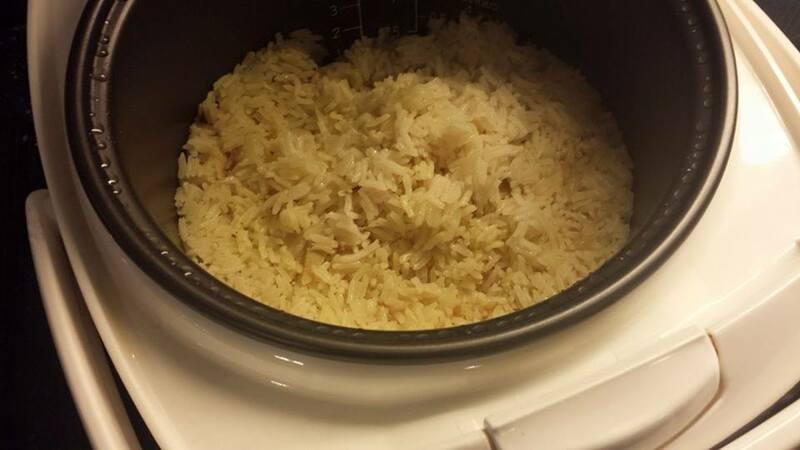 then i cooked the rice in my regular rice cooker. the rice tasted a tad soft at first, but when eaten with the chicken, chilli & black sauce (& even overnight), it tasted pretty good. i wasn’t sure about the chilli. i picked 1 recipe but did not have 6 large red chilli, so i made do with 3 chilli padi + a large red tomato. the blend needed the bulk. i reduced lime juice to 1 tablespoon (from 1/3cup or about 5 tbsp), added 1 tbsp mirin, 1/2 tsp salt, 1 tsp sugar, then blended. and after tasting added 1 tsp tsuyu. chilli taste was pretty ok. daughter said it tasted good but different from the chicken rice chilli. wife though i had too much shallot, no sesame, & just above average kind of good. i guess that was ok for my first try. saw a write-up on ST Life on enochximmanuel 6-course dinner menu 3-day event. i called up but it was the last day & i wasn’t free that evening. it was fully booked anyway. young chef enoch teo honed his skills at restaurant andre (where he worked with another young chef immanuel tee), absinthe, bistro du vin. 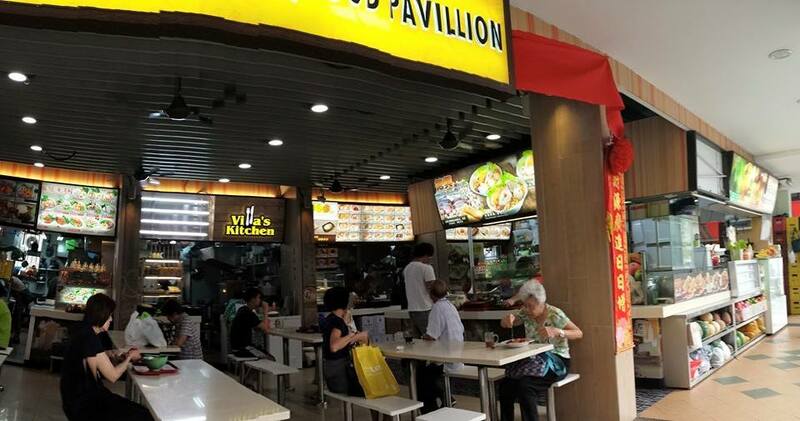 the restaurant was previously known as le petit paradis (“the little paradise” in french), which started out at alibabar hawker bar for two years before moving to its current premises on east coast road. place was the minimalist deco type, bright & pleasant, which was the right way to go. there were 2 other tables, a quiet evening. 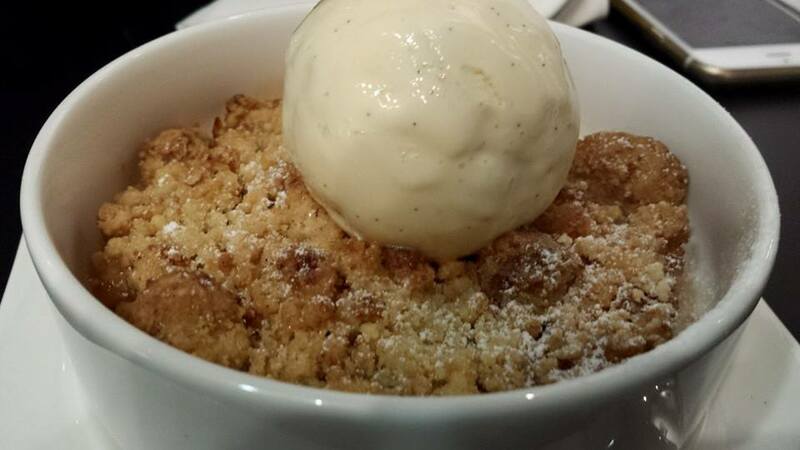 i ordered the set, which came with the truffle asparagus, their signature dish, choice of lamb or seabass (i had lamb), and dessert (which was an apple crumble). 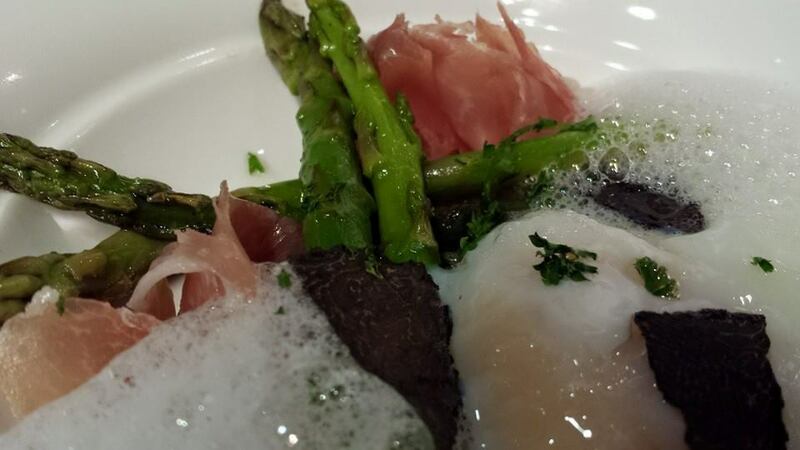 wife ordered mushroom cappuccino & truffle asparagus from the ala carte menu. surprisingly, the mushroom cappuccino was very much below par. it was firstly too salty. 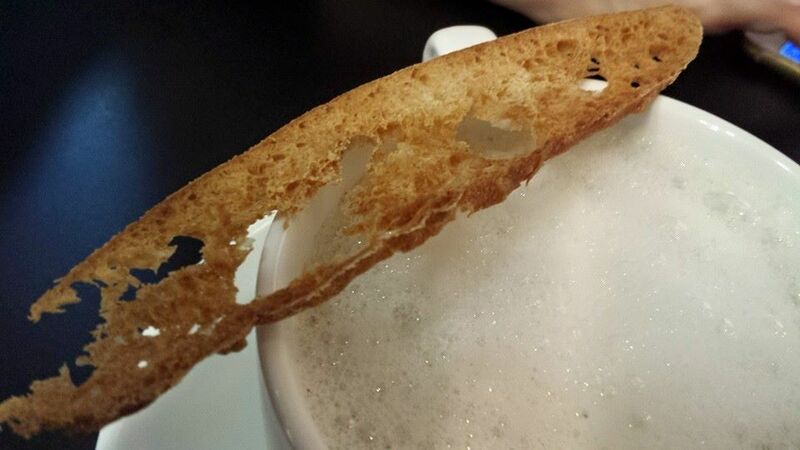 apart from the foam & the nice crisp crouton? 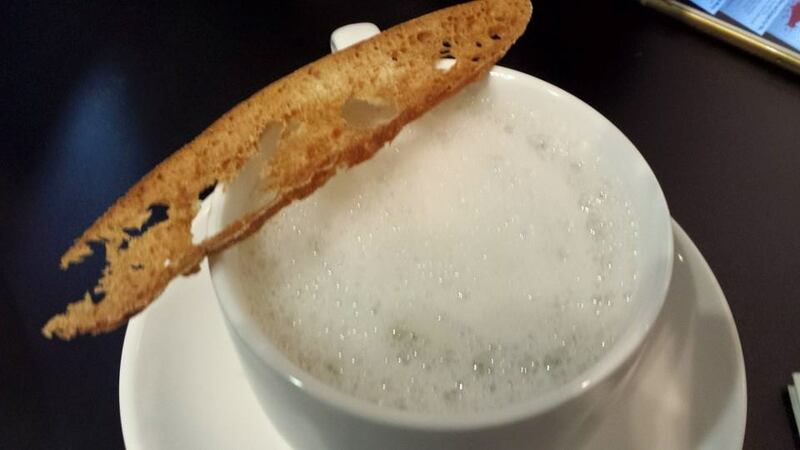 the soup was very average tasting, did not feel any intensity or flavours standing out. i do my soup better! asparagus was good. 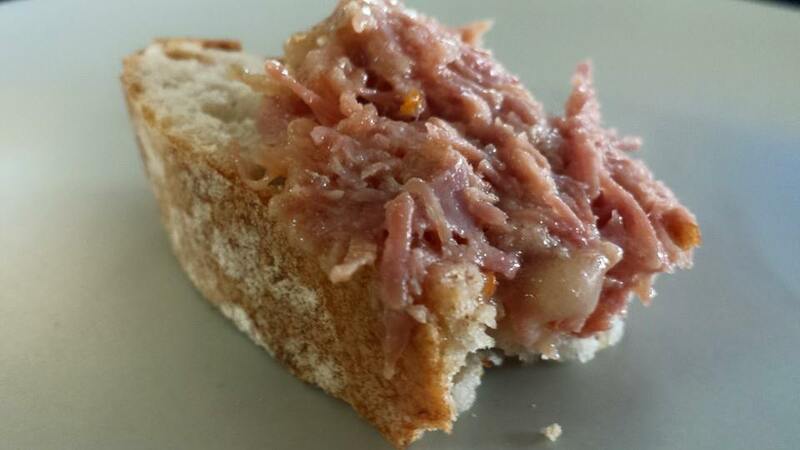 but parma ham was salty, not a very good grade. onsen egg (sous vide egg) was great texture & silky as it should be. asparagus was done very well, cooked, tasty & still having the bite, not soft. it was overall a pretty good dish, of course not in the class of Jaan’s 64degC 55mins sous vide egg with iberico chorizo. 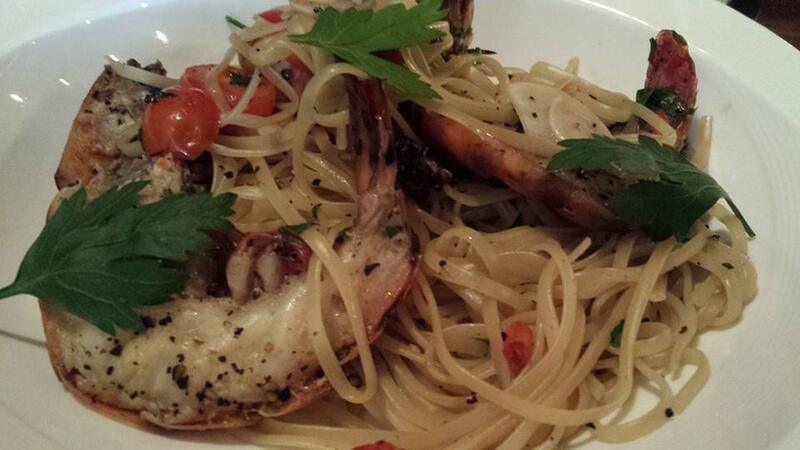 but it was a small dish, i think at most S$10, so S$17 was too pricy for this dish. the lady server from myanmar mentioned the tiny piece of truffle. i guess that is individual preference. 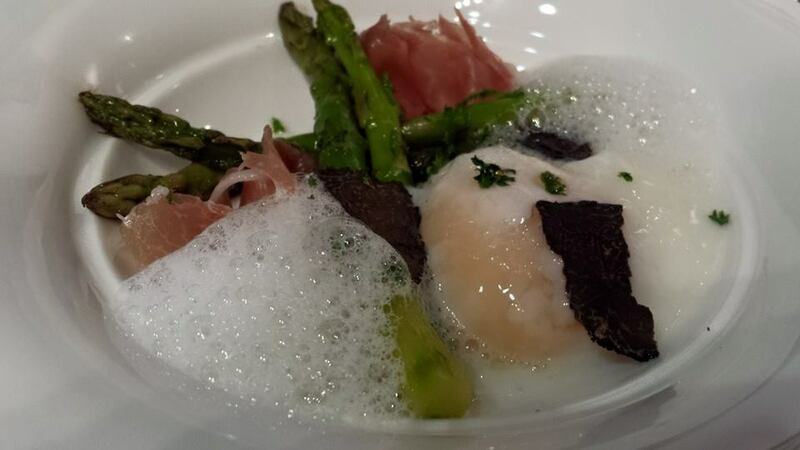 to me the tiny piece of truffle added nothing to the dish & it was better off with just a dash of truffle oil (which many restaurants do) that would add great flavours to the dish. 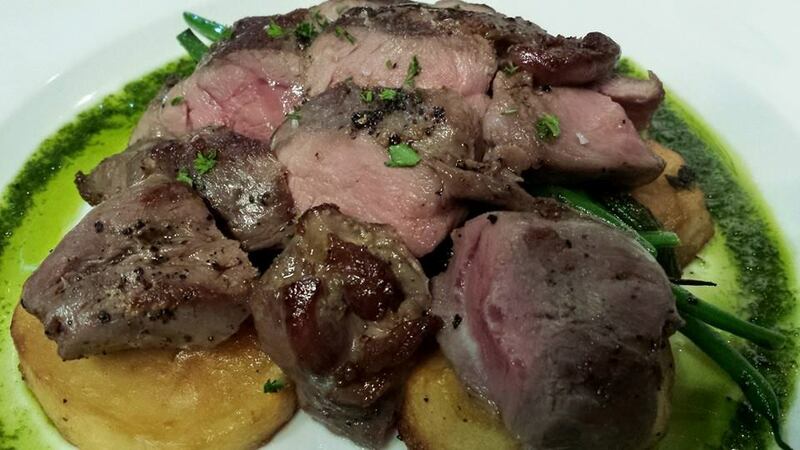 the dish that stood out was the sous vide lamb. 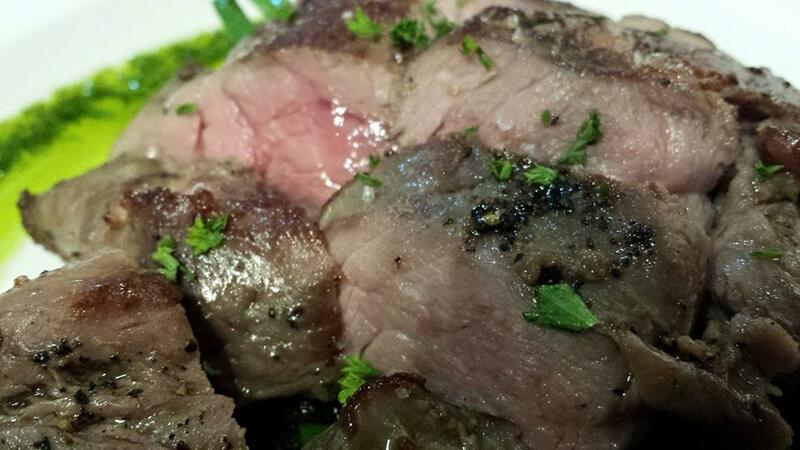 it was tender & tasty & the pesto sauce also enhanced the taste. 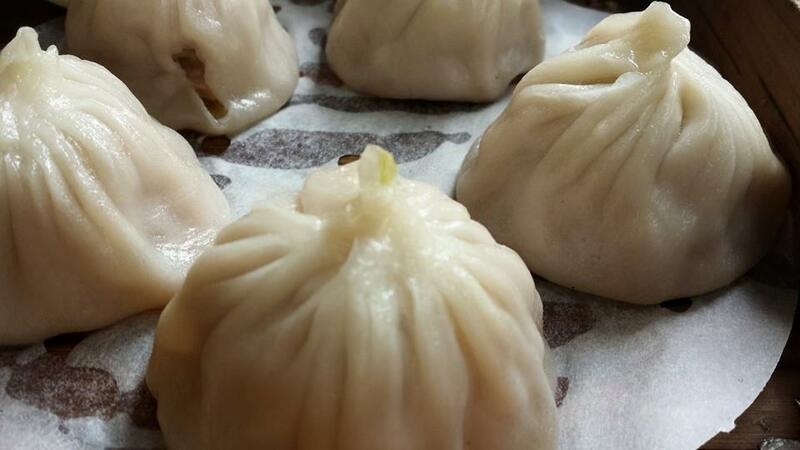 a great dish!^^ & a large helping too. 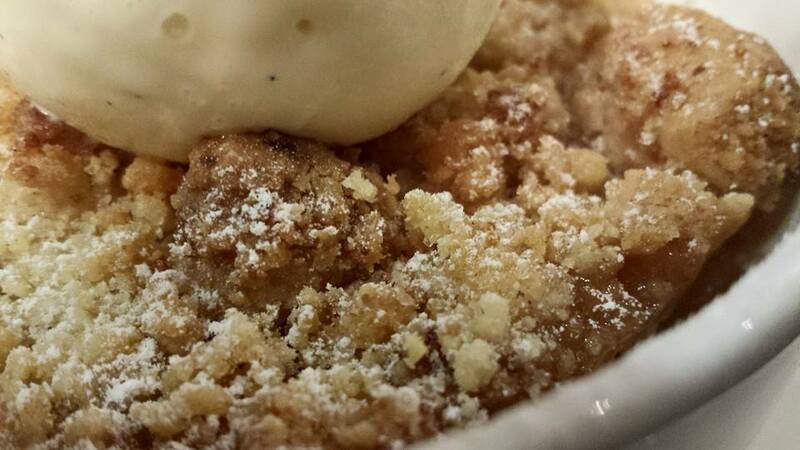 i commented to my wife “hope it is not too sweet” before i dipped into the apple crumble. 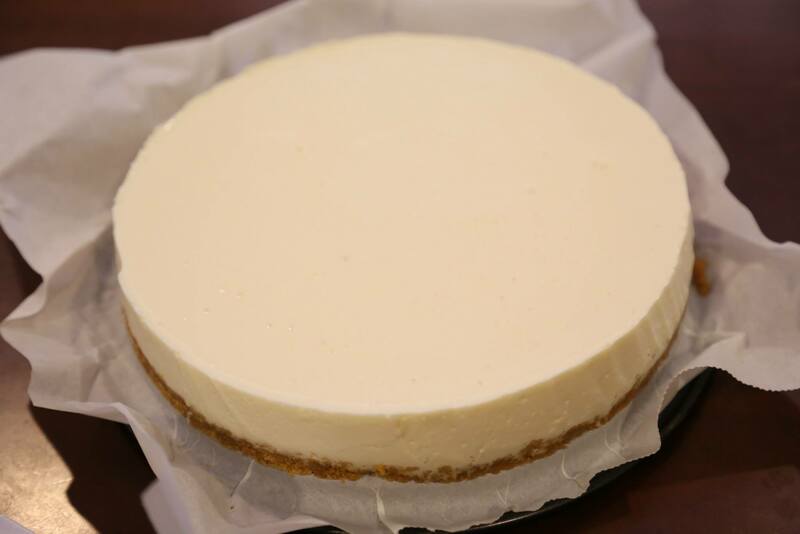 and first bite – it was too sweet! but actually after a few bites, it was quite ok because the apple was actually quite sour & the sweetness (slightly & not sickeningly sweet) counteract the sourness. 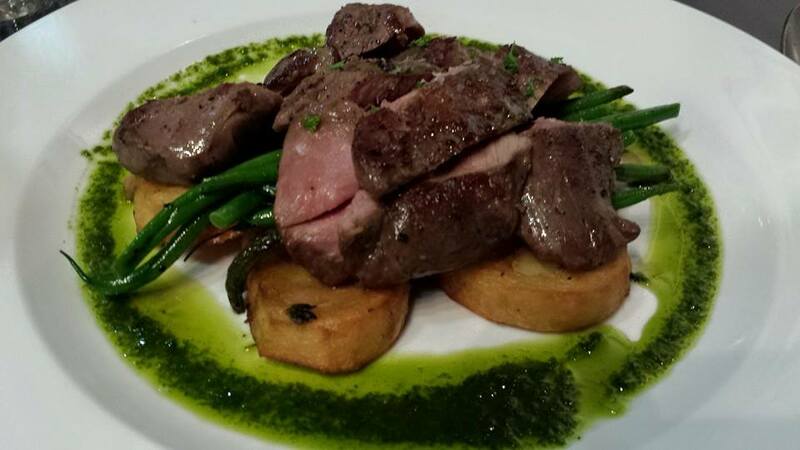 overall, other than the sous vide lamb, the dishes were just average and i think below what saveur offer. c/w concetto also, i think concetto dishes were much better crafted & plated, and much lower prices. price wise meat dishes were ok but the asparagus was overly priced, and the mushroom cappuccino was just not restaurant class. service by the myanmar lady server was ok. chef enoch was a bit shy & did not come to talk to us after taking the orders or he was much in conversation with the other table. it is an ok place which i don’t mind returning to after a while, except it is a bit farther & not the most convenient for me. 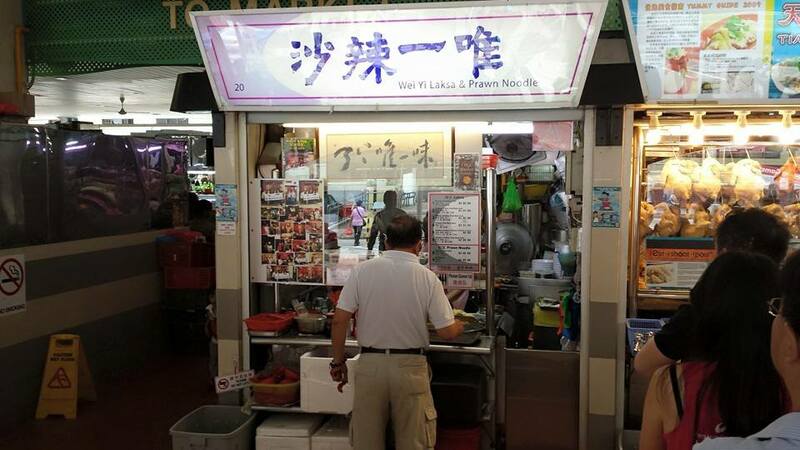 i wanted to try the laksa and order a S$4 bowl from teck hin fishball noodles for myself. 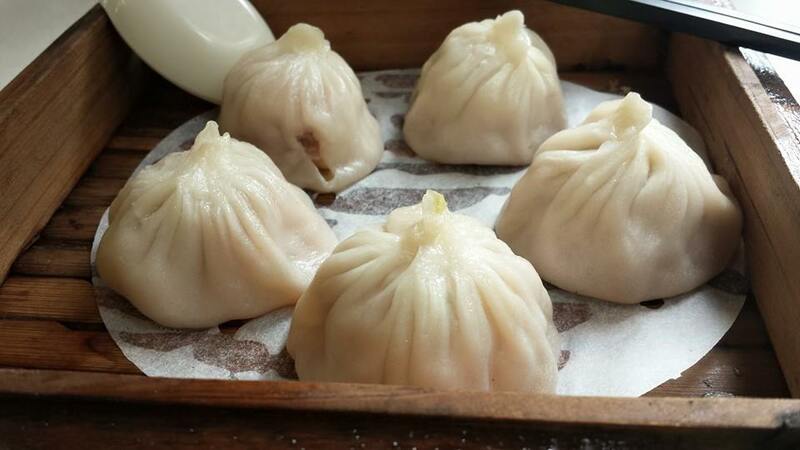 my friend was having dinner at home afterwards, so we decided to just order a S$3 xiaolongbao 小笼包 from joyful palace 怡乐坊 to share. 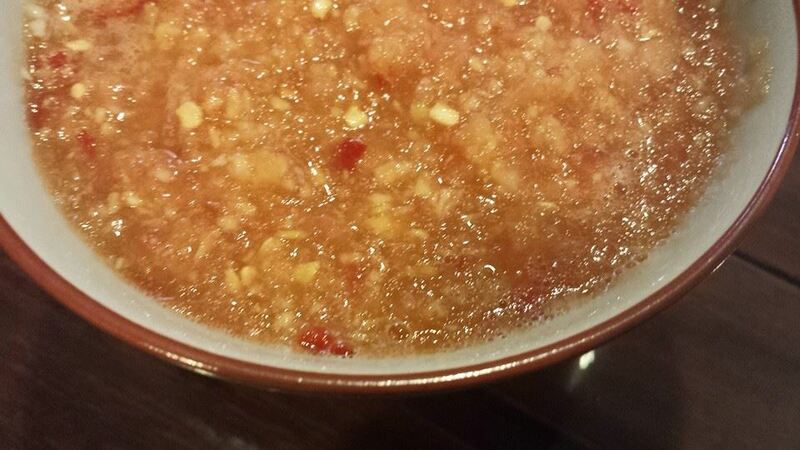 the soup was very sweet, as good as any of the restaurants crystal jade, imperial treasure, canton paradise. skin was ok not the smoothest but pretty good still. meat was tasty, kind of a bit big but then what was there to complain if it was nice? 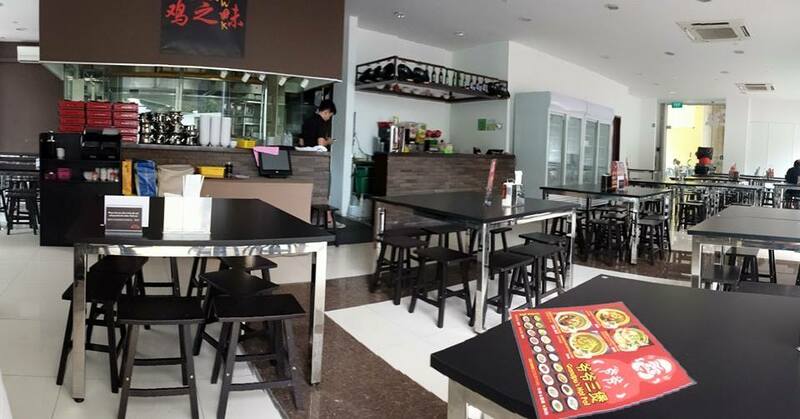 joyful palace 怡乐坊 is located at the food loft @ clementi ave 3 blk 443.
in addition to dimsum it sells the hong kong roast meats and also ramen with the roast as well as dan dan mian & mala chicken ramen. 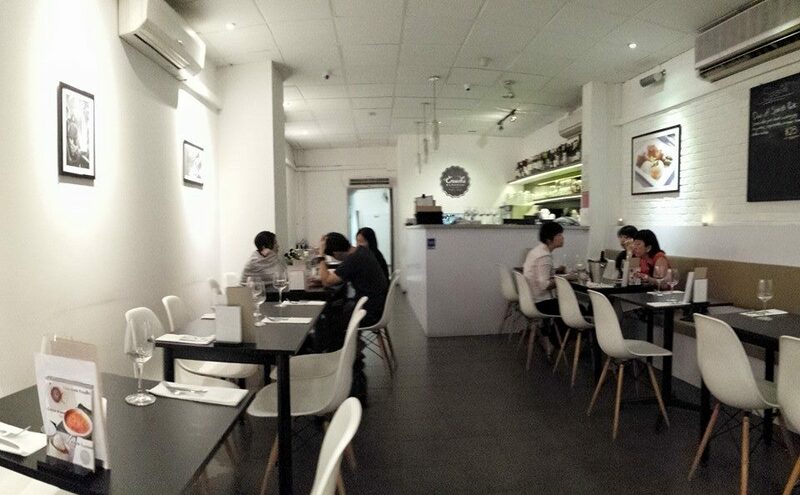 met a friend for a chat at food loft clementi ave 3 blk 443 this evening on 19.3.2015.
decided to order the laksa from teck hin fishball noodles & a xiaolongbao 小笼包 from joyful palace 怡乐坊. laksa was S$3.50 & i asked for additional “hum” i.e. cockles, so S$4. 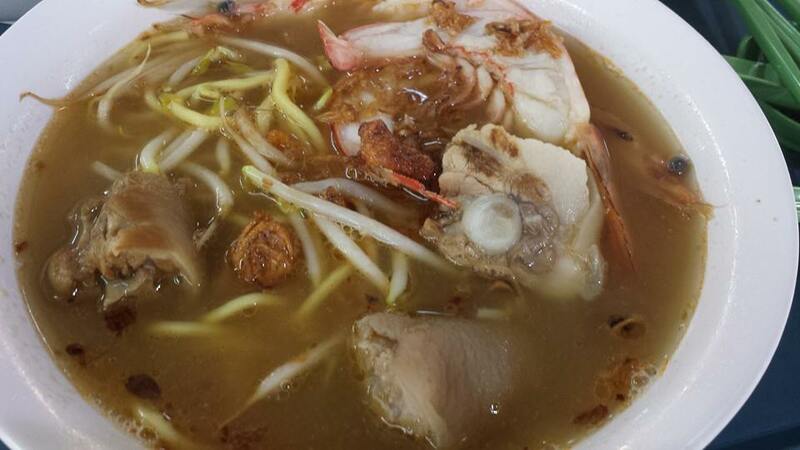 these days, there are so many katong laksa around and many places sell good competent laksa. 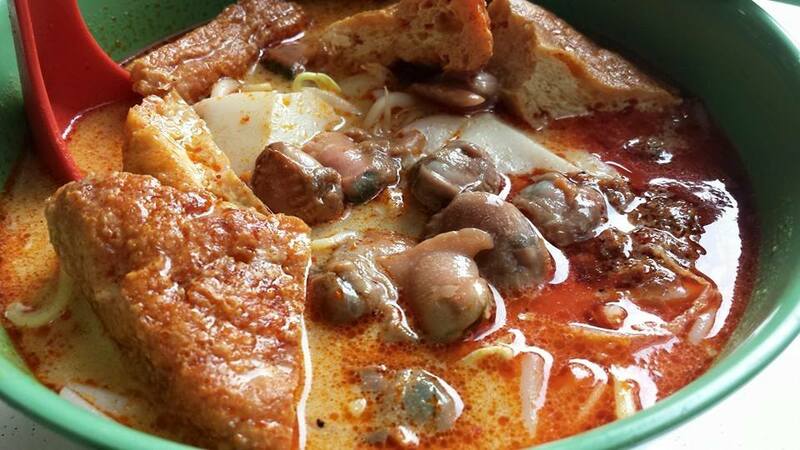 this laksa easily belong to the quite good category. 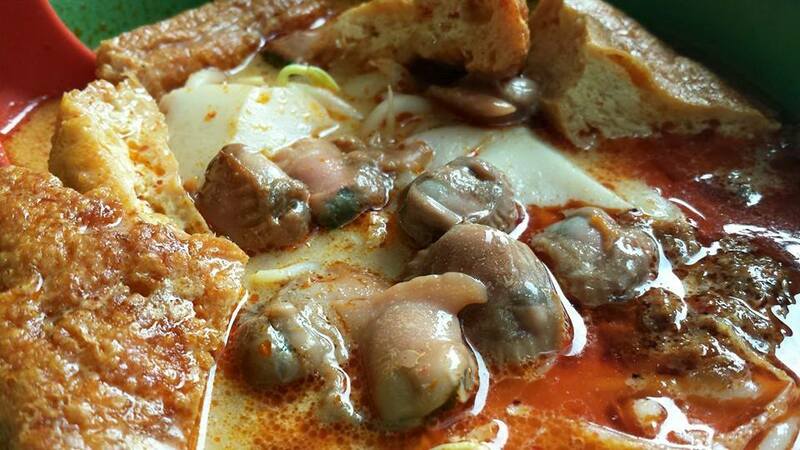 the cockles were fresh & plump, the laksa gravy was lemak & fragrant. 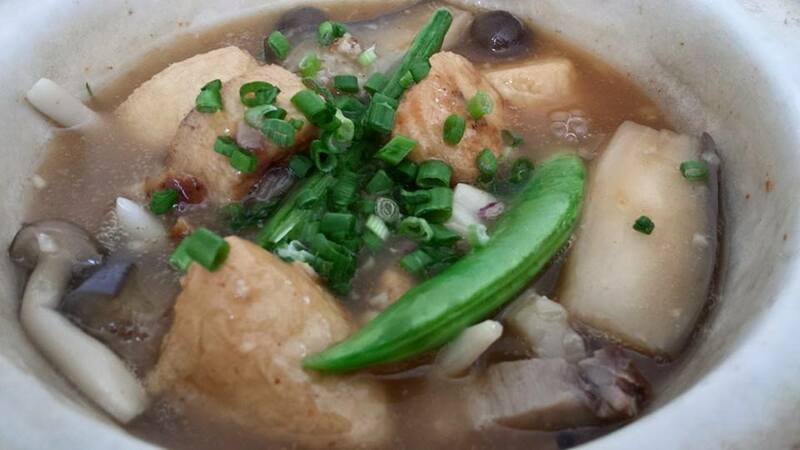 there were lots of fish cake and taupok, only thing the taupok were not soft enough so not absorbing the gravy well enough. 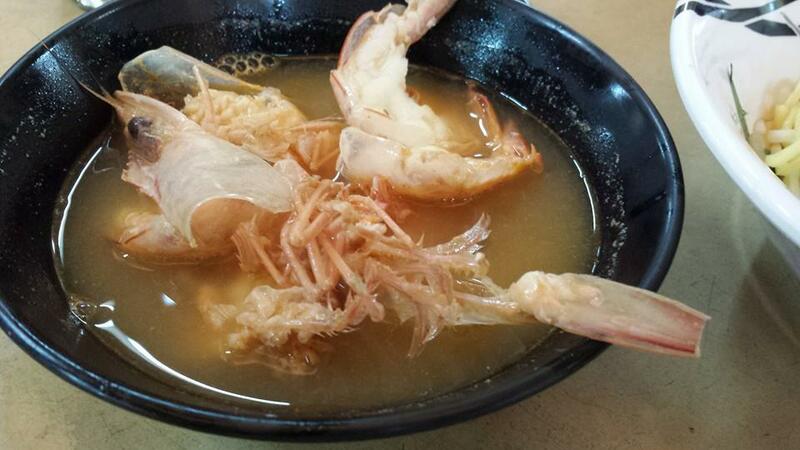 need less to say, it was no match for the S$2 sungei road laksa. 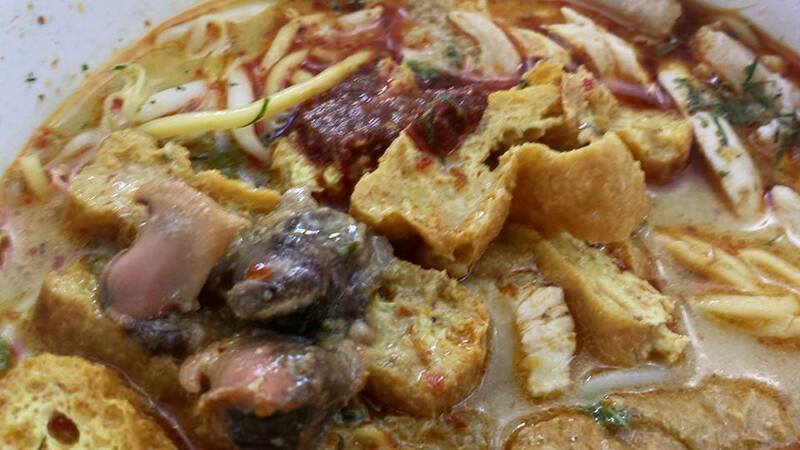 still on the whole, this really was a considerably good laksa. i would certainly take this again here. 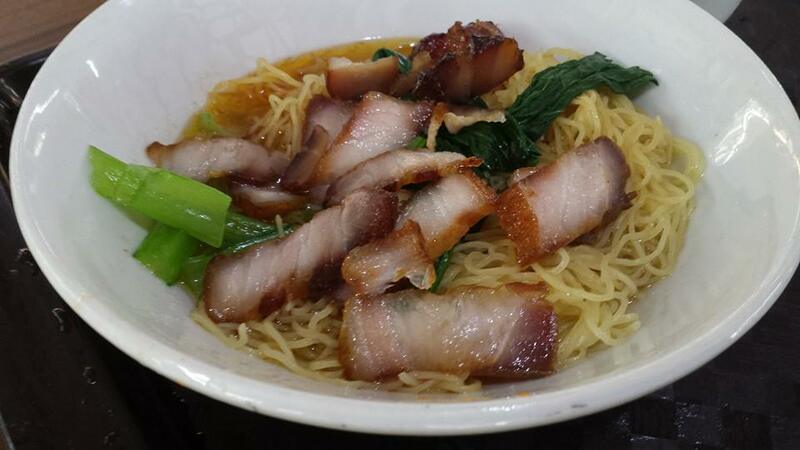 my bil opted for a S$4 wanton noodles. 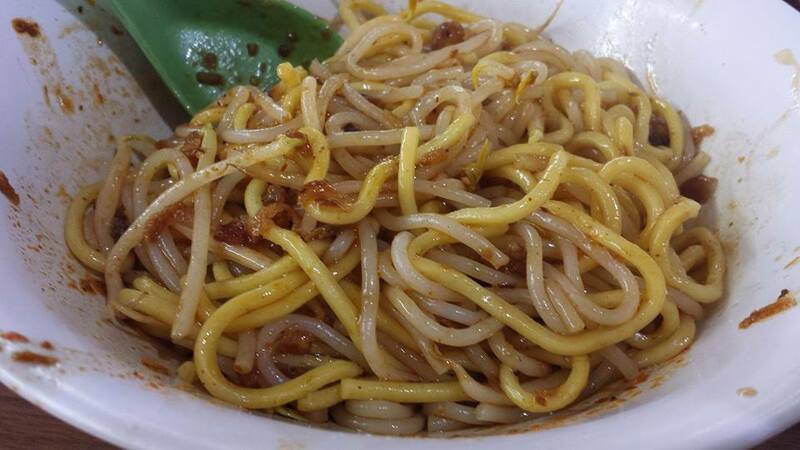 according to my bil, the noodles were good too, qq & with very good chilli mix. wanton were smooth. 6th avenue wanton noodles at good good eating house is my recent favourite but this looked really good & i will be back to try it myself. 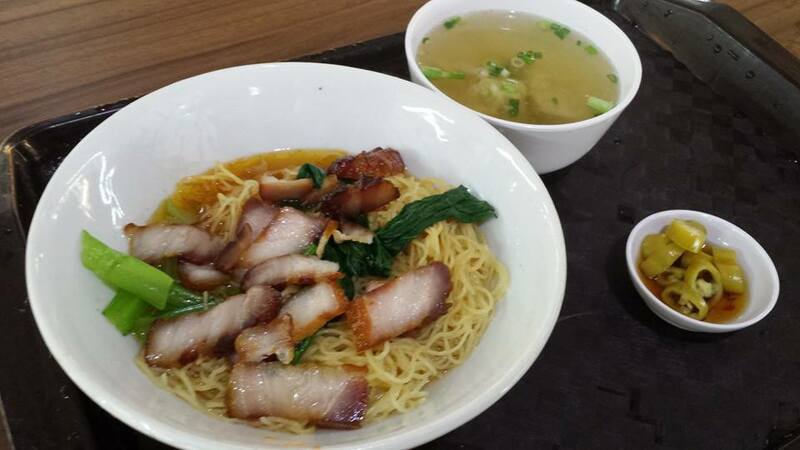 kok kee wanton noodles (formerly at lavendar food square) was the best i had tried bit not sure where it has moved to? apparently to a coffee shop is on the ground floor of nearby hoa nam building, but still to check out. bought 2 boxes of 250g white button mushrooms from sheng shiong earlier i think it was on sale like S$2.80/pkt. 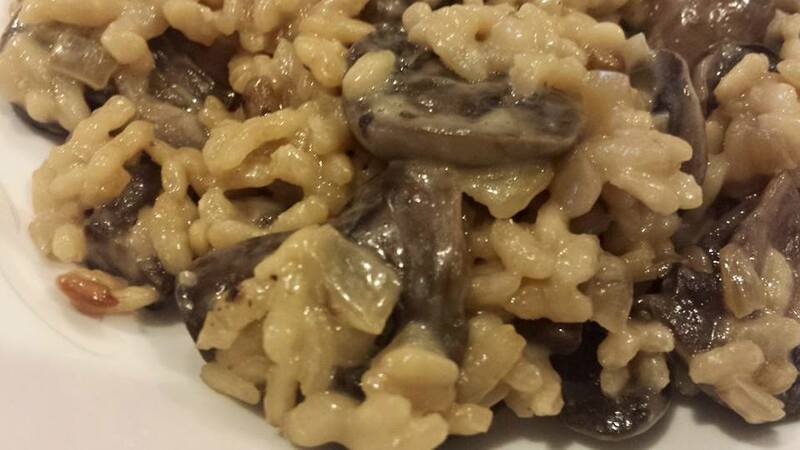 they were turning brown though so i had to cook them & i decided it would be fungi risotto. everything was excellent. 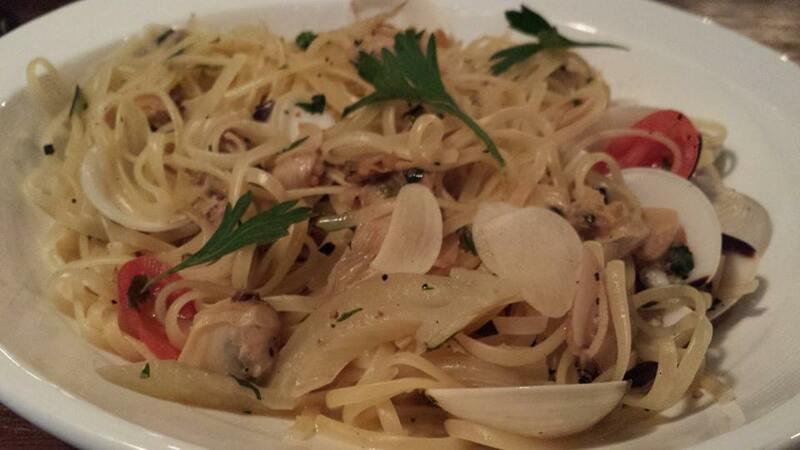 good intense mushroom flavours, just enough creamy texture, very nice texture of rice, slightly al dente in the centre. i looked up the recipe i used last time (2 years ago) as i had not cooked this since. looking at the beautiful photos then, it was probably as good or better than what i did this time, but it was quite some time back, so i enjoyed it just as much this time. i had the mushroom sliced & then placed in an oven proof pan with butter (20g or 1+ tablespoon) & 1 teaspoon salt. 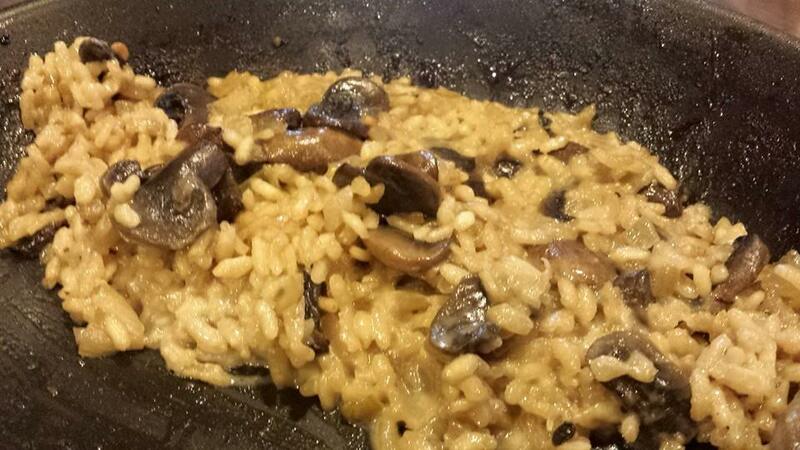 i went through the dry, wet, dry process, about 10mins until pan was almost dry & mushrooms started to caramelise. meanwhile i chopped 1 large yellow onion & added to the pan & fried till soft (about 5mins). 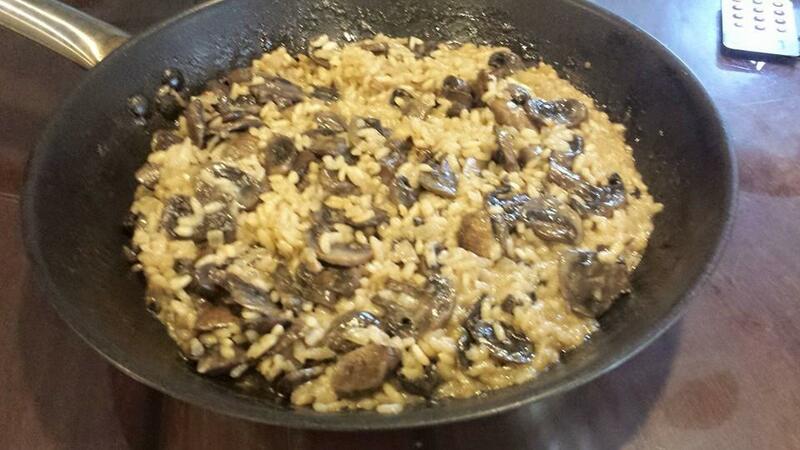 i also washed 1 cup of arborio rice, added to the pan & fried with the mushrooms & onions. i thought i had vegetable stock in the fridge but i did not. so i had to improvise. i mixed 1 teaspoon sugar, 2 tablespoon mirin, 1 tablespoon sake & 2 tablespoon tsuyu in 1 cup of water, tasted it & i liked the taste. 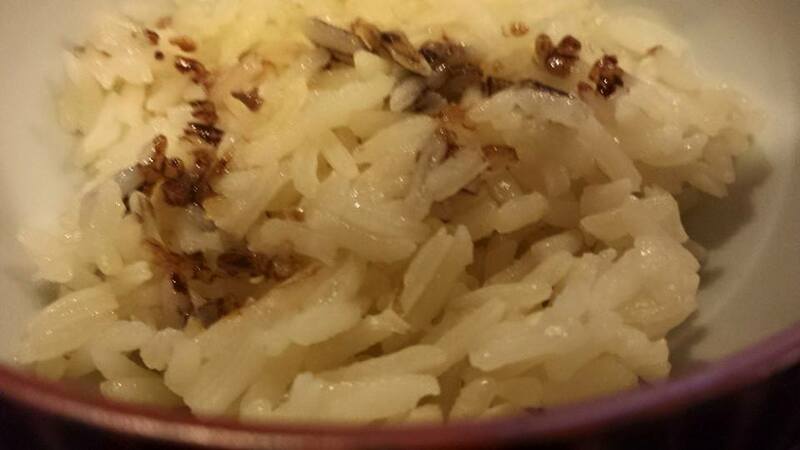 i added this to the pan so it just fully covered the rice & put to medium high until the liquid boiled. i placed the pan in the oven preheated to 205degC & baked for 10mins. i removed & tasted the risotto. taste was good & centre was still hard. then i added water to just cover the risotto & added 1/3cup (80ml) thickened cream, put to high heat to bring to boil then turned to medium heat, stirred & reduced. it probably takes 5mins to reduce. 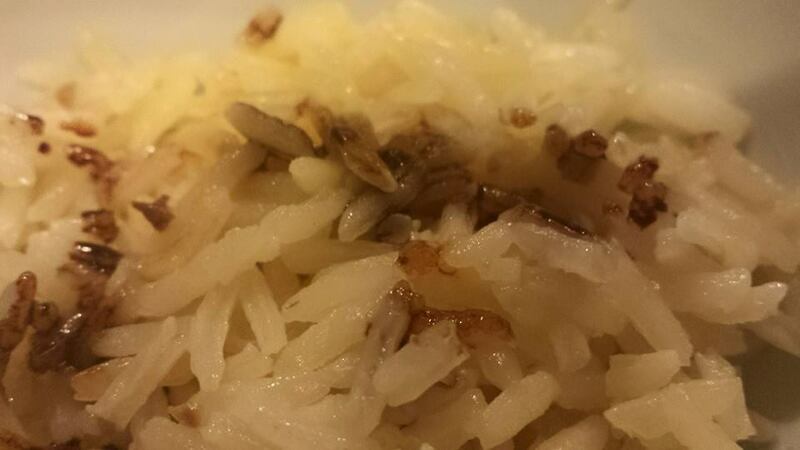 taste to make sure that risotto is not overcooked & still al dente in the centre. 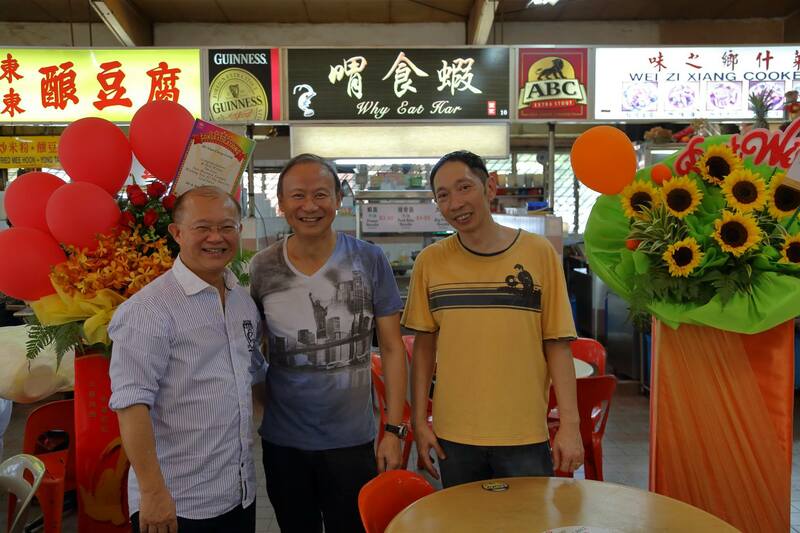 went with my sis & bil to balestier food centre today on 17.3.2015.
sis & i decided to have the prawn noodles at ah hui 阿辉 big prawn noodles. 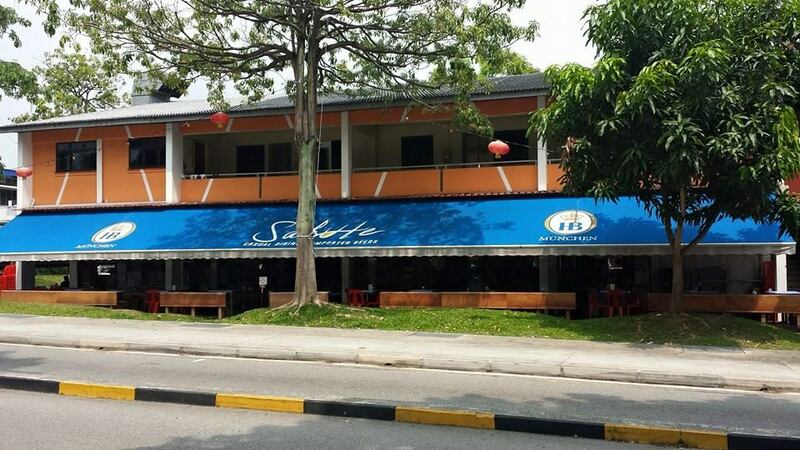 the stall was previously located at long house, the popular 14yr eatery at upper thomson road. we were early at 11am so there was no queue. my first reaction was that the chilli was not as good as that at “Why Eat Har”, which was spicier, more tasty & gave a better kick – maybe more haebeehiam?? not sure. i tossed the noodles a bit more and the taste improved. 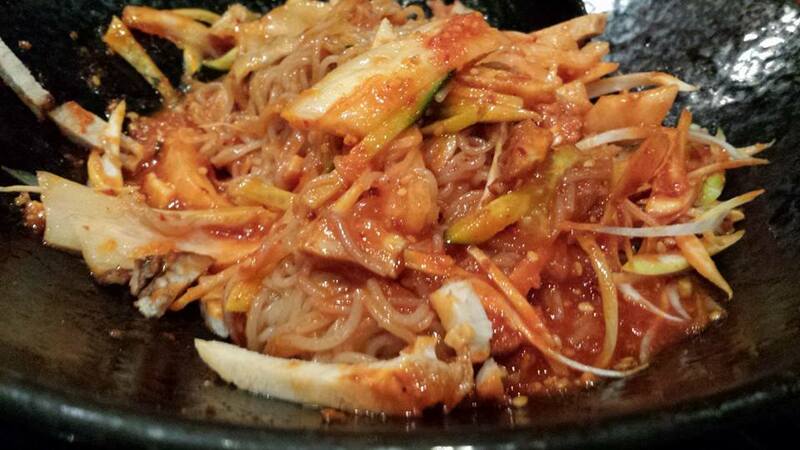 this amount of noodles was just nice & much less than that at “Why Eat Har” as observed previously. the soup was very tasty & intense! my first reaction was that this soup just pipped the one at “Why Eat Har” which was also very good. 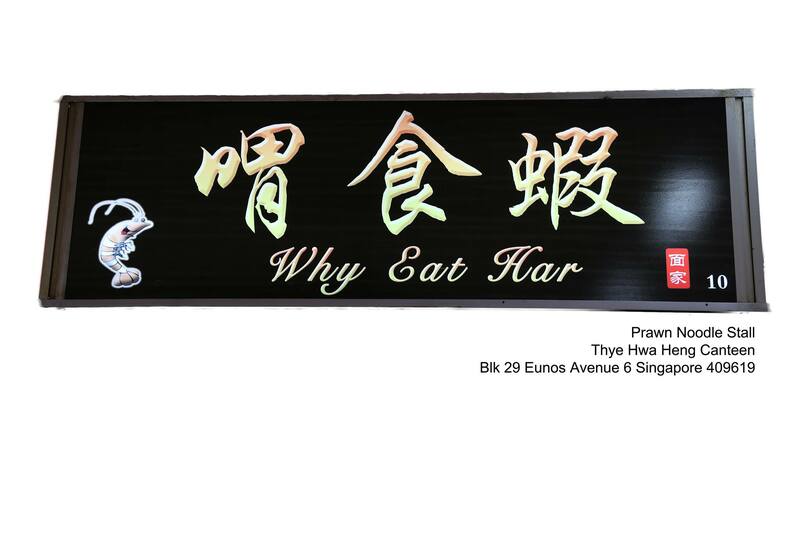 “Why Eat Har” is just 2 week old, so have to go back there & try again. will probably try the big prawns for comparison. my sis had the $5 prawn+pig’s tail noodles. 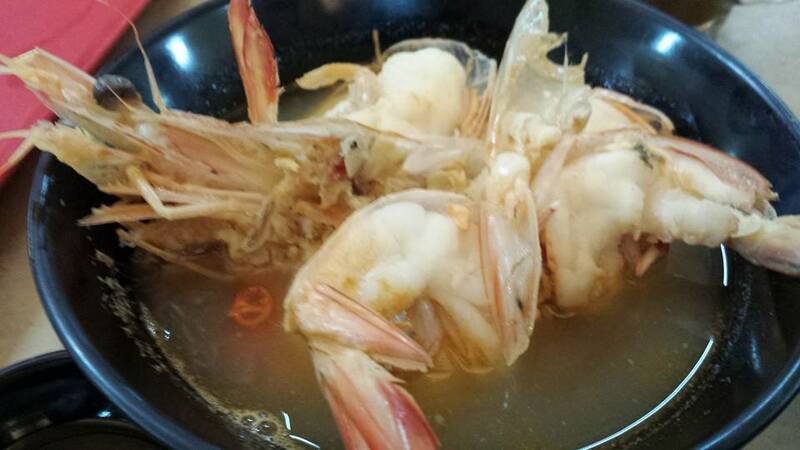 this had 3 half-prawns + 3 pieces of pigs tail. this option was not available at “Why Eat Har”. for those who want pigs tail, this seemed like a very good option. there about 5 tables were occupied & only 1 server who was quite good overall though strangely she did not automatically serve us dessert & coffee when we finished food, and we waited a long time before asking her. 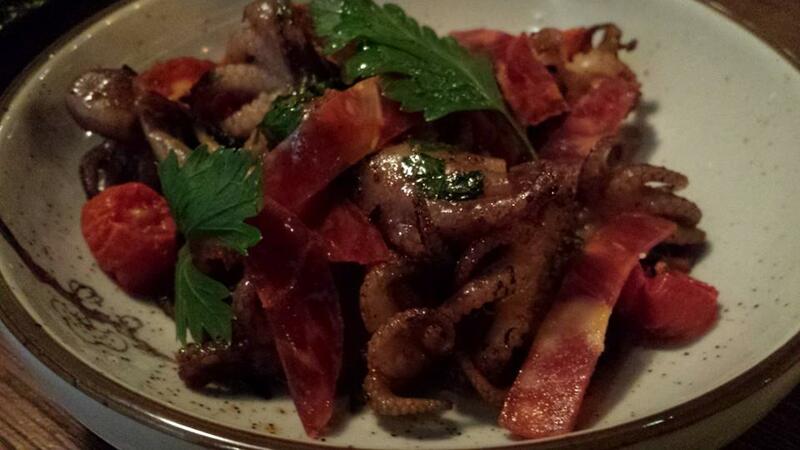 we ordered the deep-fried pork belly & sous vide baby octopus for starters to share. 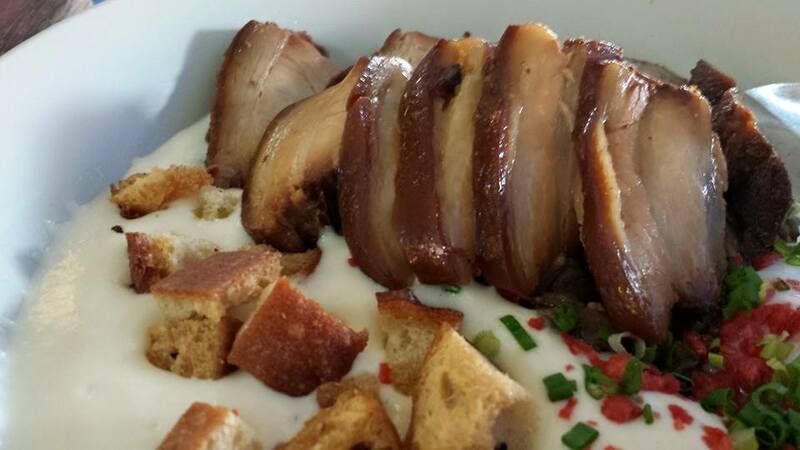 we had wanted to order the smoked duck & wagyu cubes we saw on other reviews, but they were not available for lunch. 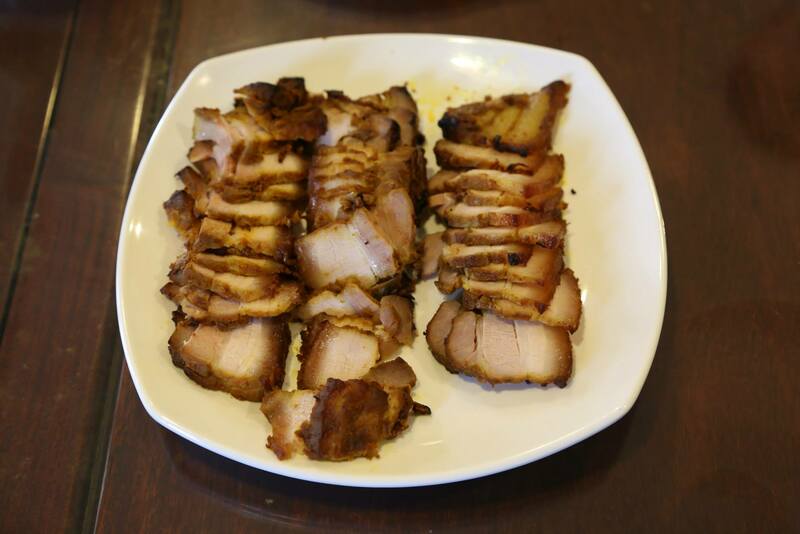 pork belly was an ok bear finger food, but not comparable with the standard roast pork in most chinese restaurants like crystal jade, imperial treasure, tunglok & canton paradise. 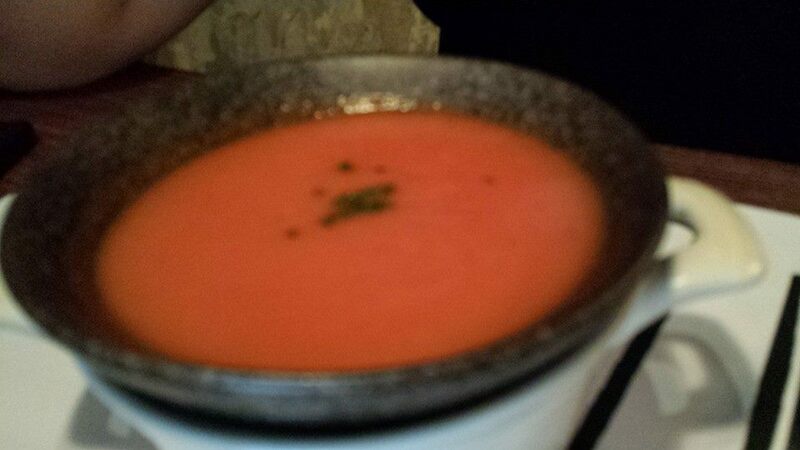 1 friend had the tomato soup of the day. 2 of us had the waldorf salad. 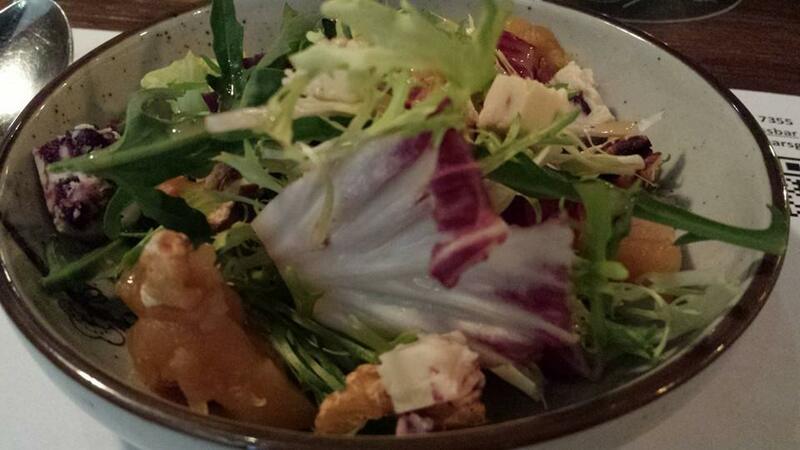 salad was good, crunchy veg, & quite a few lovely cheese. tomato soup was good too. it was the standard restaurant fare, not my favourite. 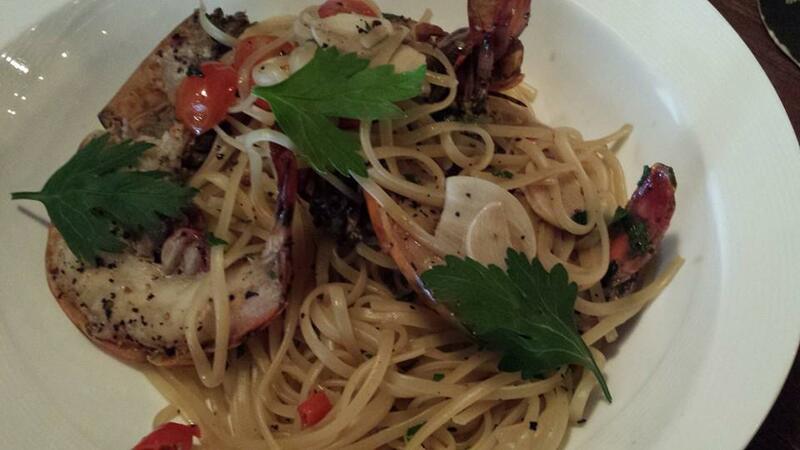 2 of us decided to skip meat main dishes & ordered 2 pasta mains to share to share. 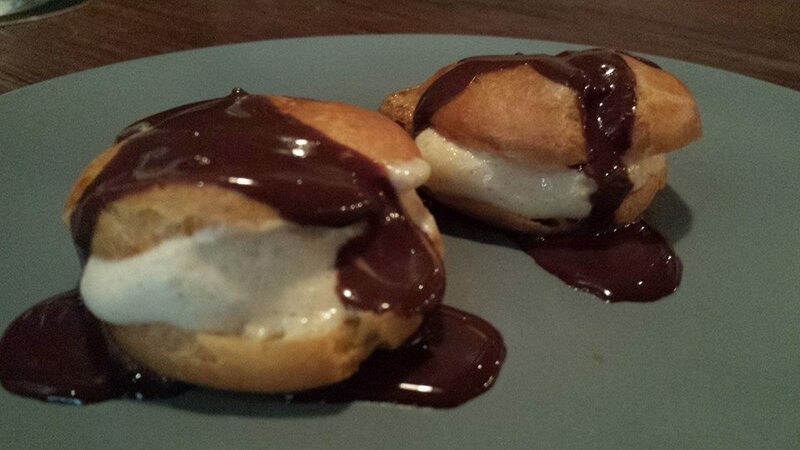 1 friend ordered the profiteros. 2 of us had regular coffee. the lunch came to about S$120 or S$40pax nett. not too bad. food was pretty good restaurant standard if not overwhelming. 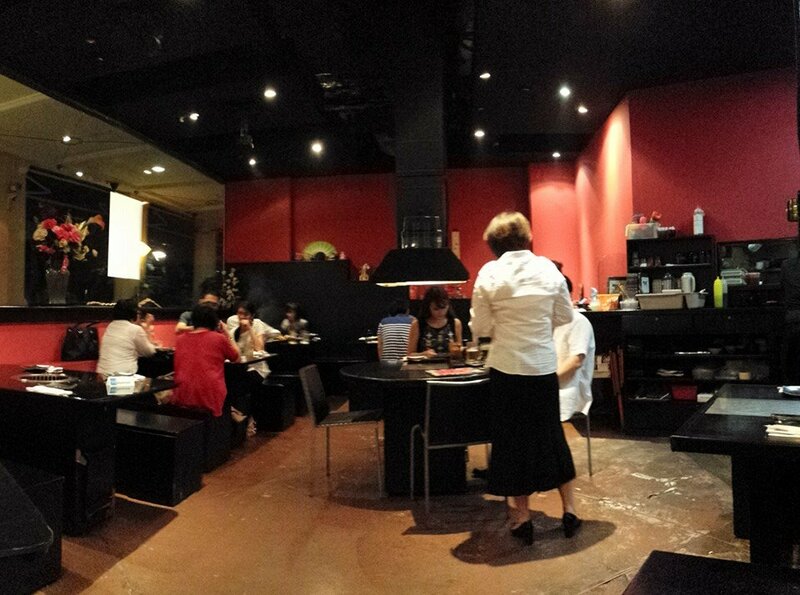 had an excellent dinner with wife on sunday 8.3.2015.
we went to our favourite yakiniku restaurant, aburiya.^^ last time we were here was 6.10.2014.
we called up last minute, & was able to still get a seat inside. the outside was quite full though. 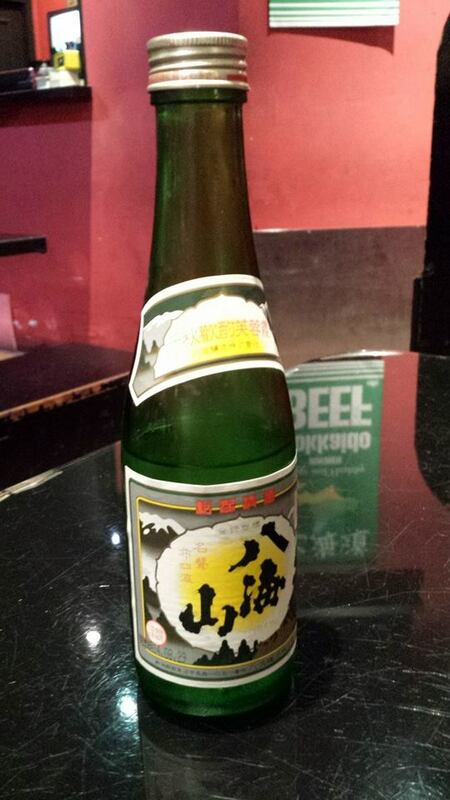 wife ordered here usual sake, a hakkaisan. 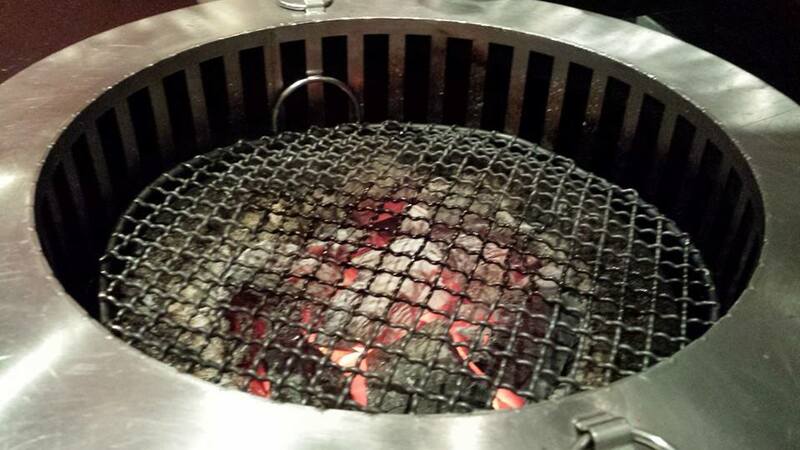 the grill is recessed into the table & also has powerful suction on the side, so it is entirely smokeless. contrast this with axmaya omakaseya yakiniku, which has quite bad ventilation & leaves you smelling of bbq meat when you leave the restuarant. 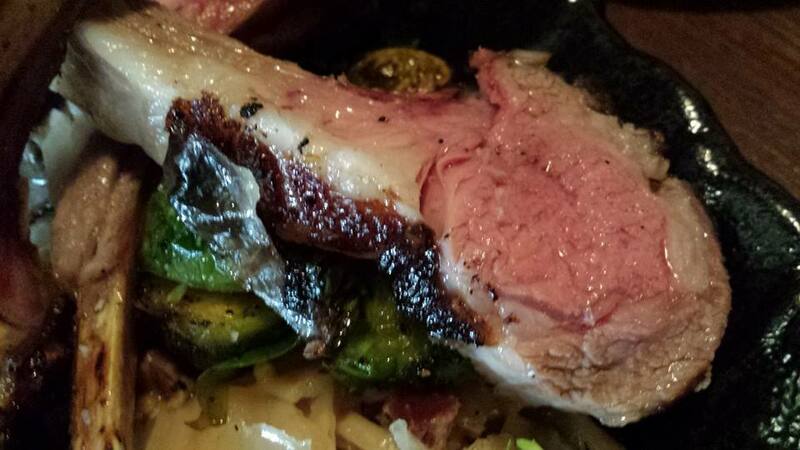 the meats were excellent. the hokkaido jo karubi or special boneless beef rib (top photo) was good. 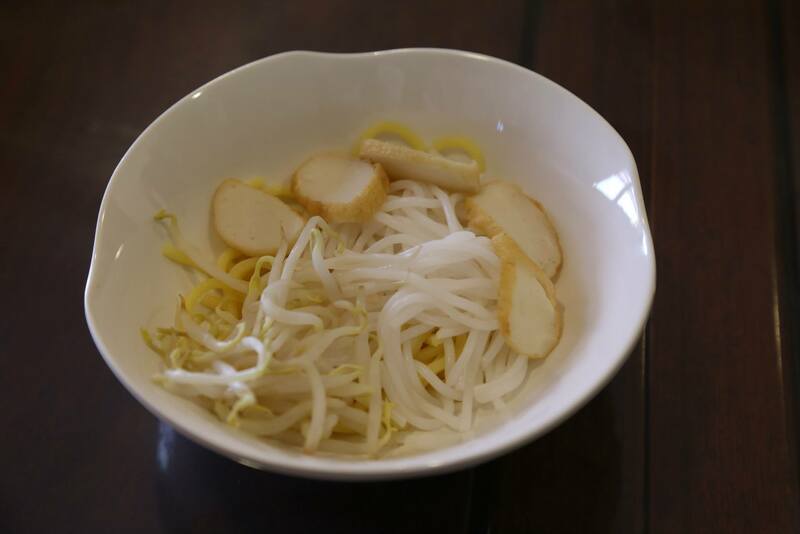 so was the jo karubi negi (with leeks). 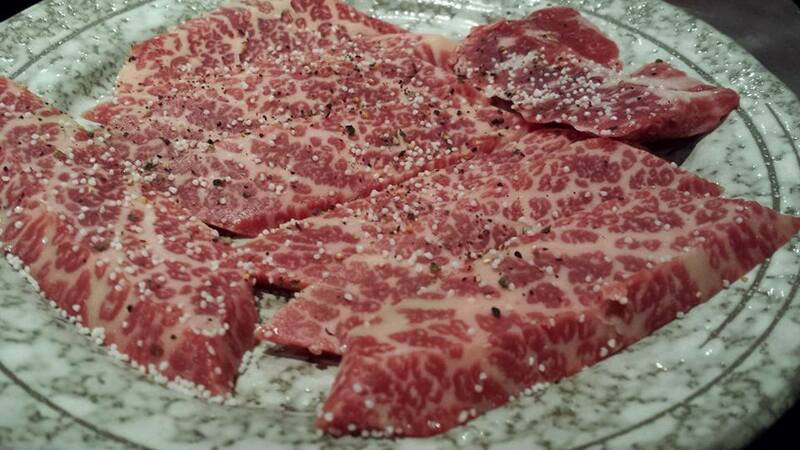 we did not find the hokkaido beef so outstanding for the price actually. the cheaper beef did quite well. 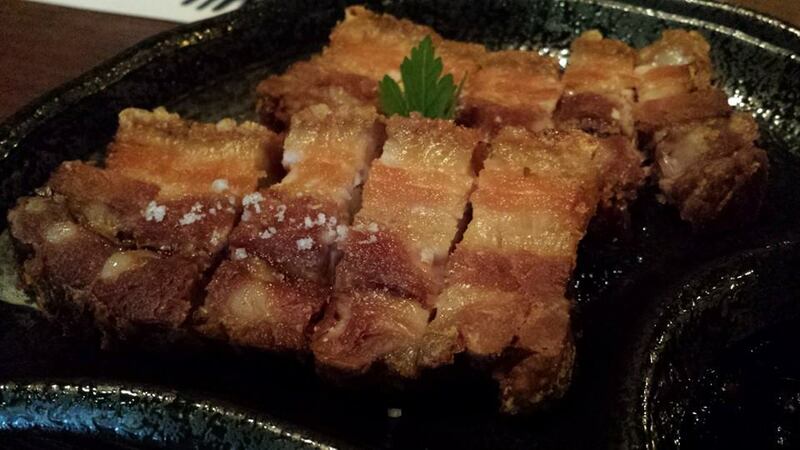 the kurobuta pork belly was great too. i liked it. 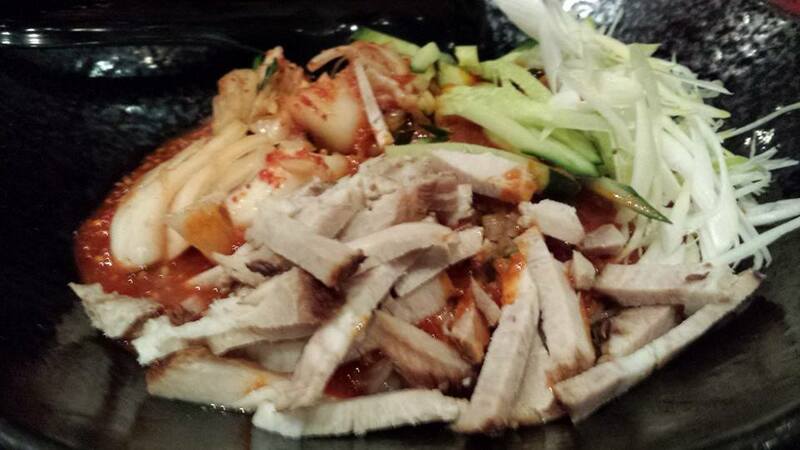 & we just love the kimchi chigae here. 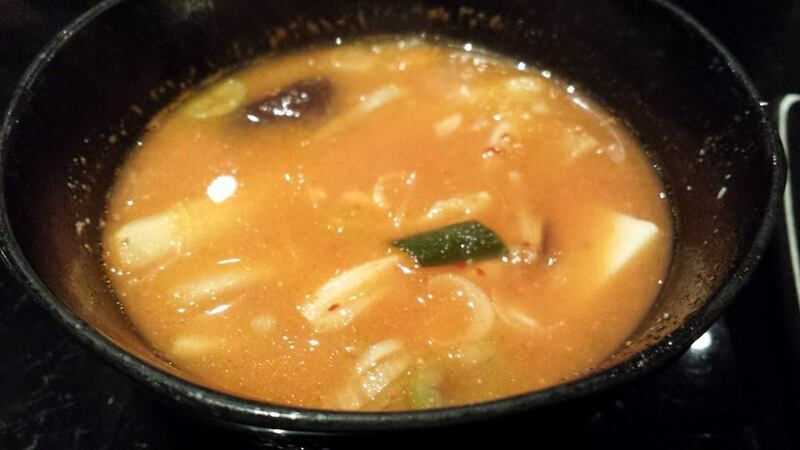 somehow the broth was really very very tasty, even better than the hotpot kimchi nabe at shirokiya. 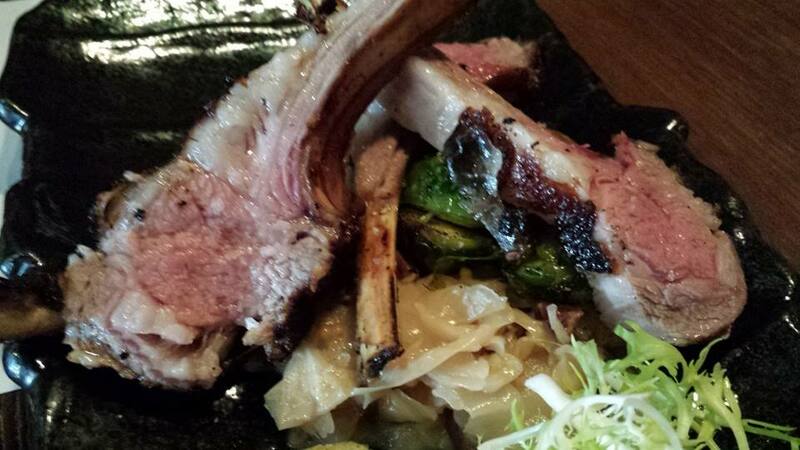 the dinner came to S$120nett for 2pax. it was kind of expensive. less the sake it would be like S$90 for 2pax. c/w azmaya omakaseya. azmaya has much better quality of beef & with the 50% discount the price would be about same or less c/w aburiya for much better beef. however aburiya was a more complete & enjoyable meal for us because we like the kimchi chigae very much and also the bibimen. another thing the ventilation at azmaya is really bad c/w aburiya’s smokeless grill. for myself though i am quite happy to go back to azmaya if the 50% continues. carpark was full. looked like >50% taxis. i circled almost 1 round. fortunately turnover was real quick! 🙂 taxis are moving out of lots just as quickly so we managed to park almost immediately. there were about 6 pieces of red grouper fillet. grouper was very nice, fresh & sweet. 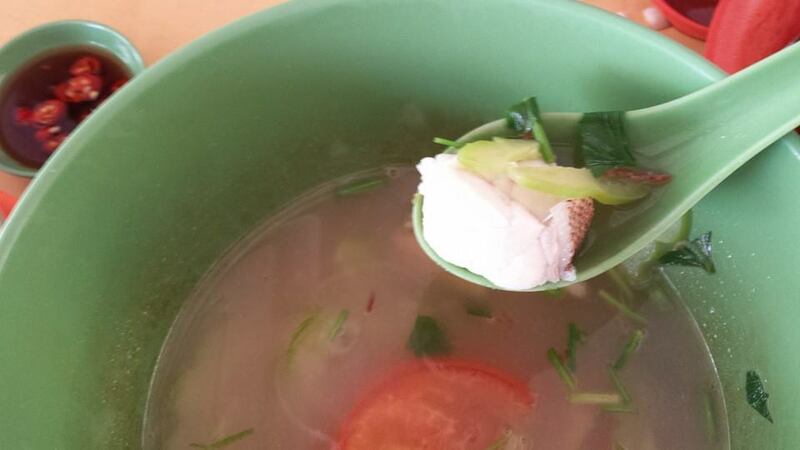 we ordered a S$10 havelock turtle soup. it was as good as the last time. 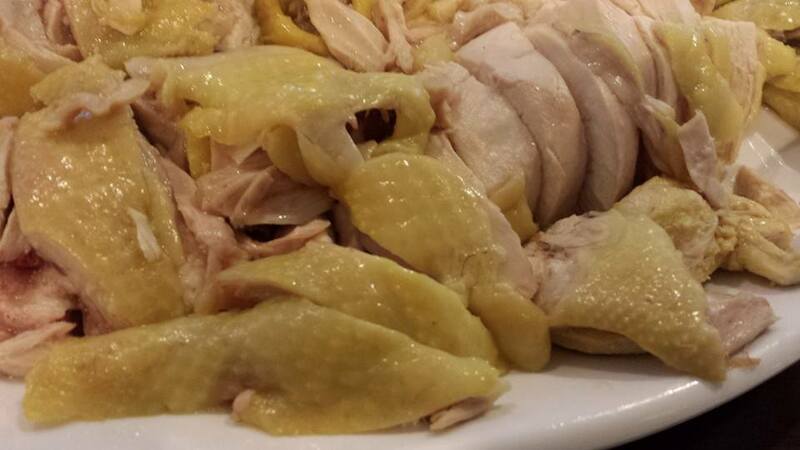 there was a lot of meat, gelatine pieces, innards, but no turtle leg. the soup was very tasty though maybe psychologically, we all thought it was by comparison more dilute than the intense soup at tan ser seng. we also had a S$6 kueh chap & S$1 for 2 large kueh. 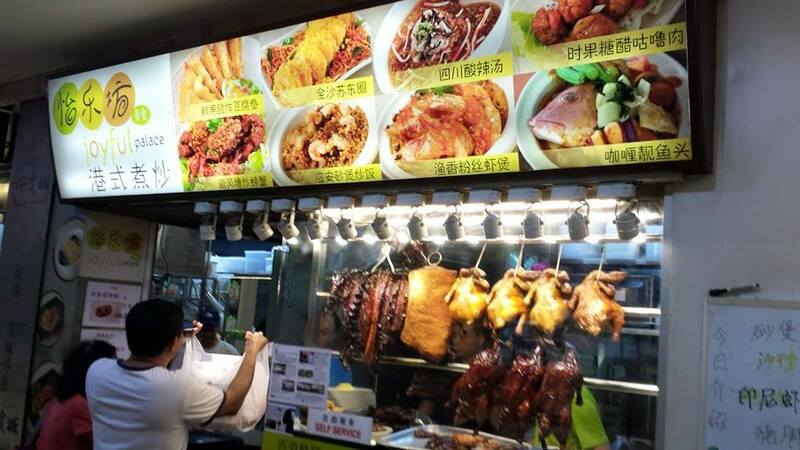 it’s probably not expensive as it had quite a bit of kongbak (braised belly pork), big intestines & small intestines, and pig skin. the taste was also very good. 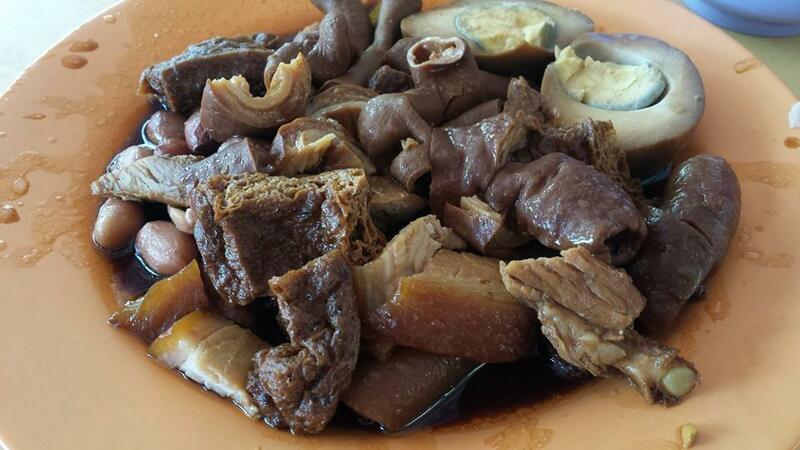 not sure how to compare, but i guess this was quite a good kueh chap overall. 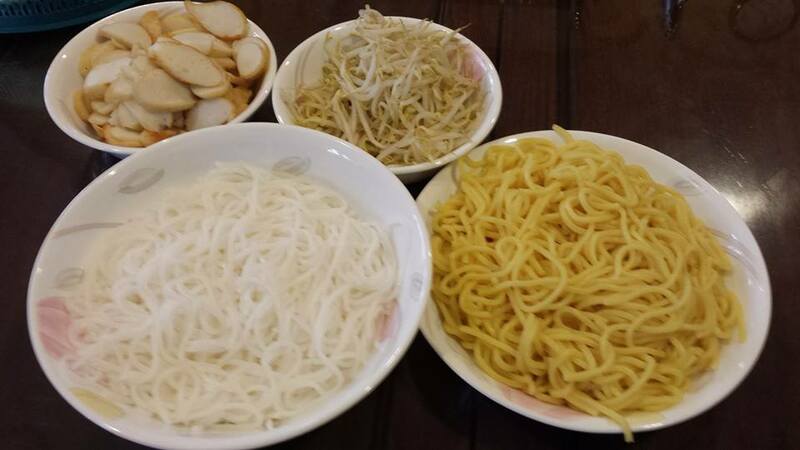 a friend brought very nice appetising achar made by his m-i-l.
i started the 2 dishes – crabless beehoon & chilli crab angel hair pasta when all my friends arrived at 1pm+. 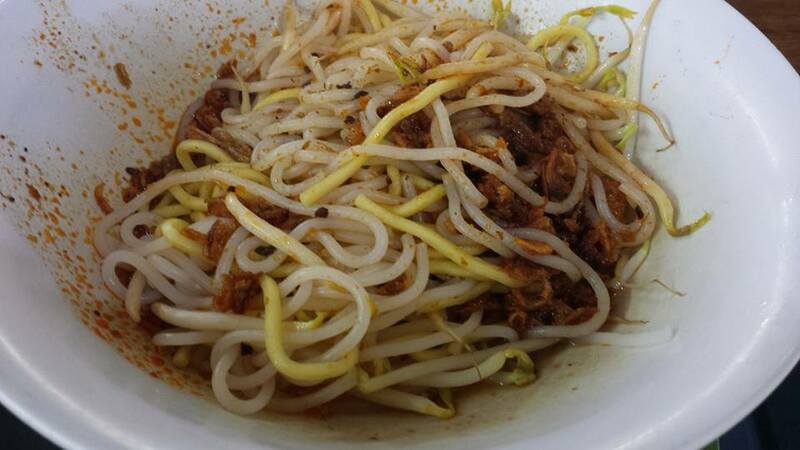 for the “hong lim FC curry chicken noodles”, this had to be served last. first its stronger taste would mask the other 2 dishes. 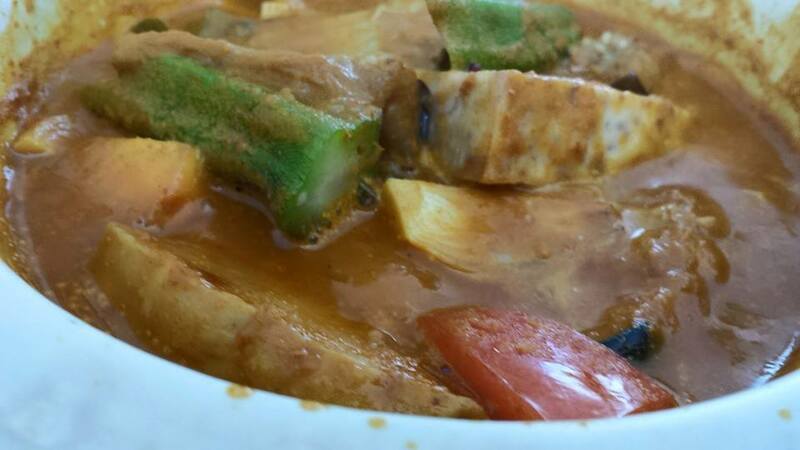 second, it has to be served hot in individual bowls – would be completely cold after all the group photos etc. 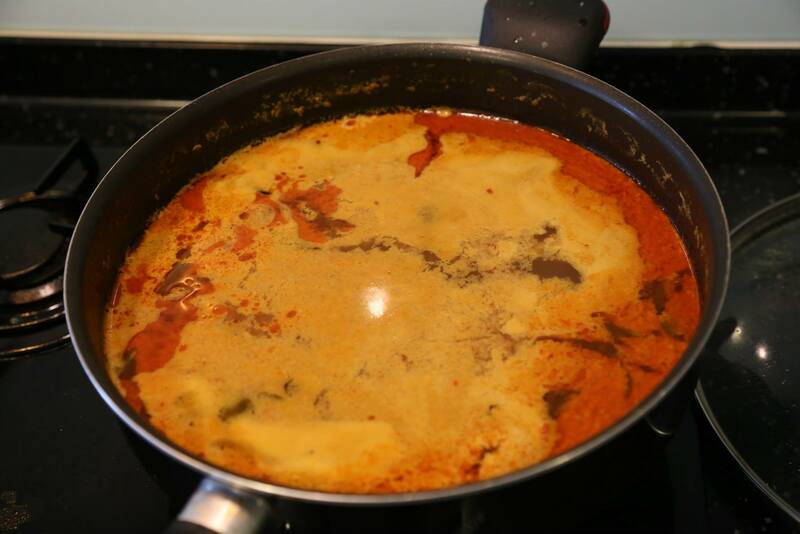 the curry was more difficult, but on this second try, i think it was quite close to the real thing. 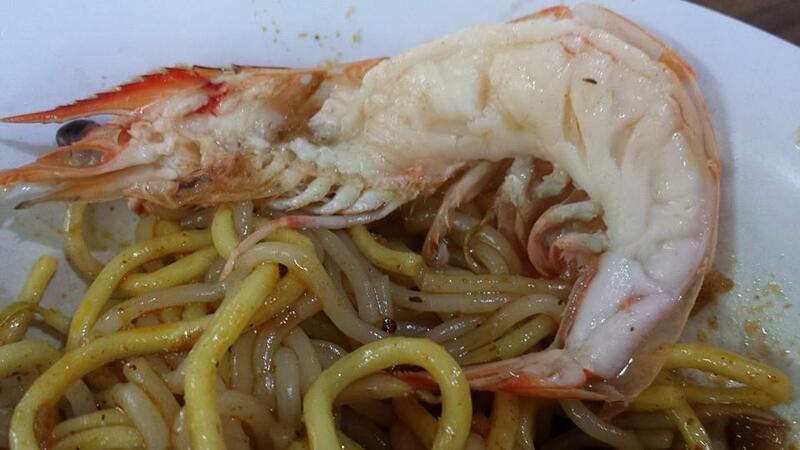 my close friend’s brother just started a prawn noodle stall Why Eat Har last week, and some of us had already tried it. i was sharing that it was such a difficult thing to achieve. 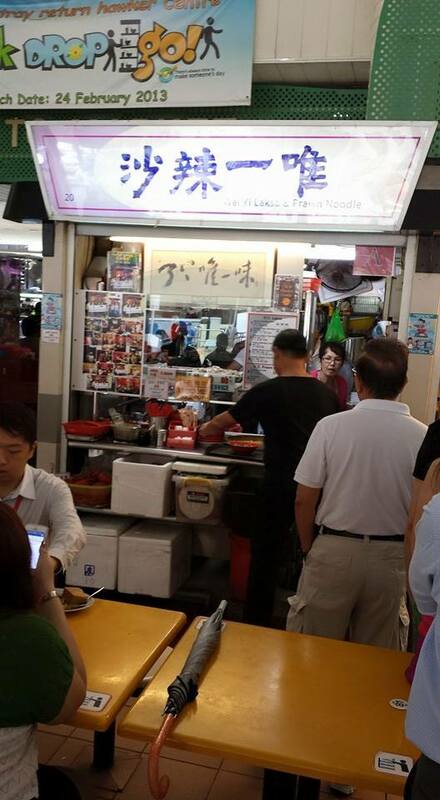 for me, his prawn noodles was already among the best & serving in large volume to paying customers, but for me, i can get close to ah heng’s curry chicken noodles but still not quite! 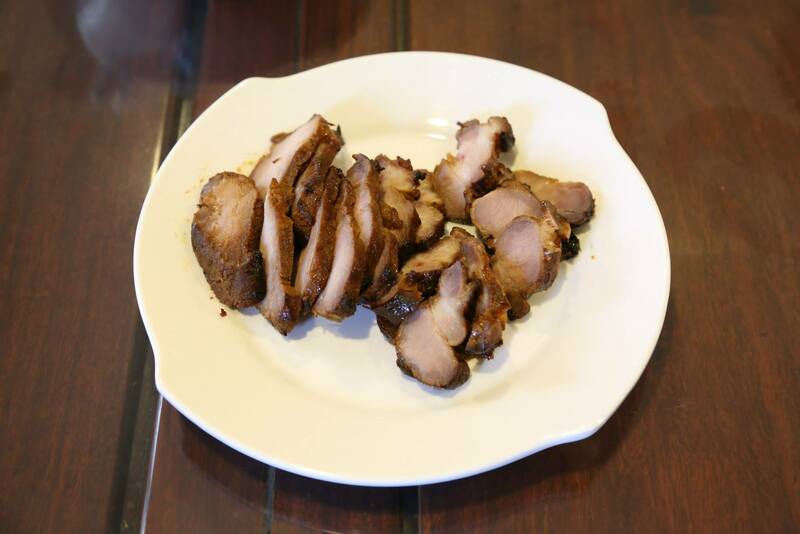 char siew was 1st time using pork neck & also this preparation. char siew sauce was the same recipe i used previously but i used slow cooking for 8 hrs in the oven (at 90degC for 2 hrs and 80degC for 6hrs), then browned slightly at 250degC for 15mins. 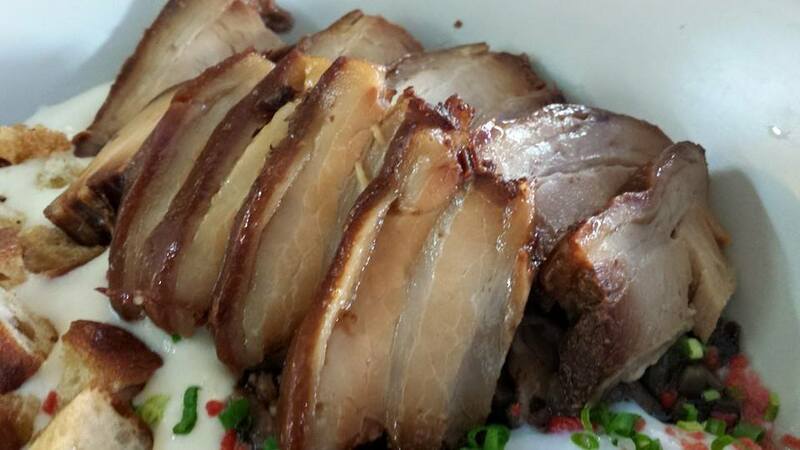 char siew was flavourful & tender. many friends did like the taste, but i felt it was not anywhere near a good quality char siew, so i may experiment a bit more with it. 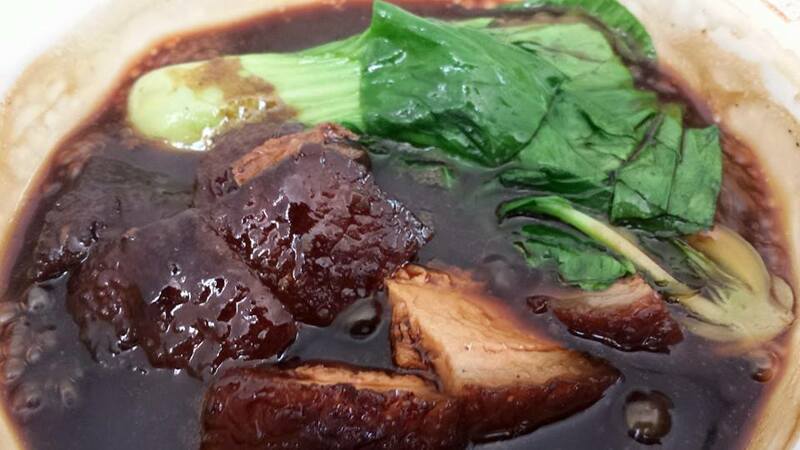 the curry miso belly pork was edible but many things were wrong with it. 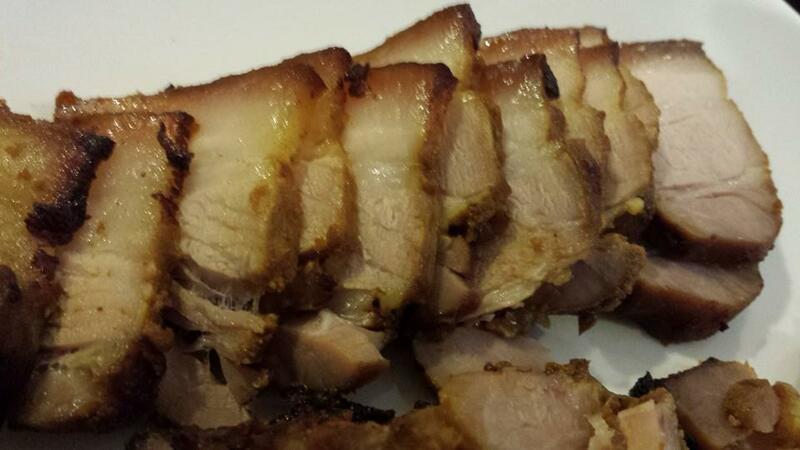 i made a very good curry miso lamb recently (1st try) so had wanted to experiment on belly pork. for the lamb i added stock & vegetables & the result was like a casserole, very flavourful, tender & moist. 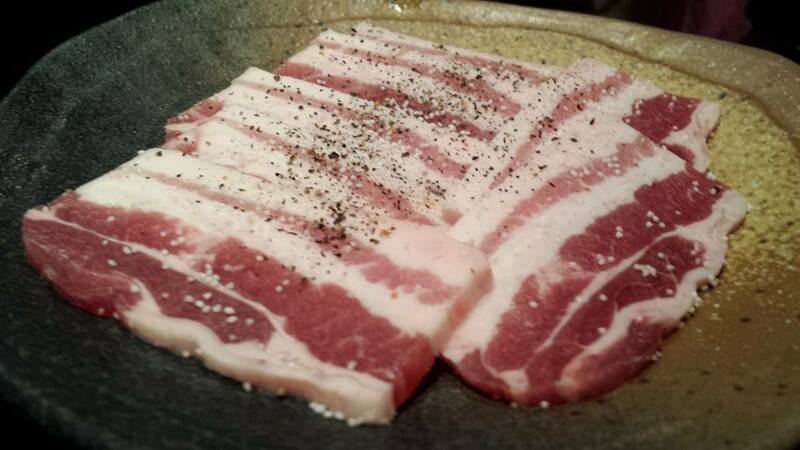 but i decided to do this using just the dry rub. the result was the skin was tough not quite edible & the curry taste was too strong & not moderated with the miso & vegetable sweetness. got to rework this. 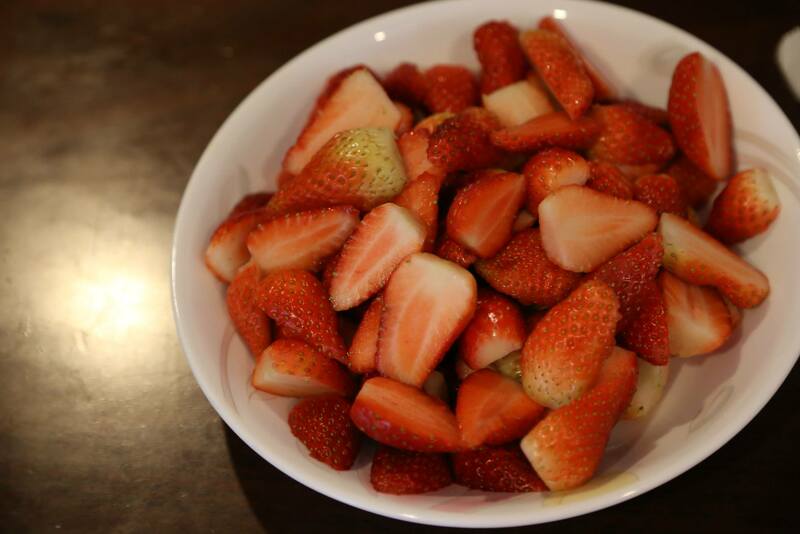 we had my usual tofu cheese cake which everyone loved, and strawberries brought by our usual strawberry supplier. 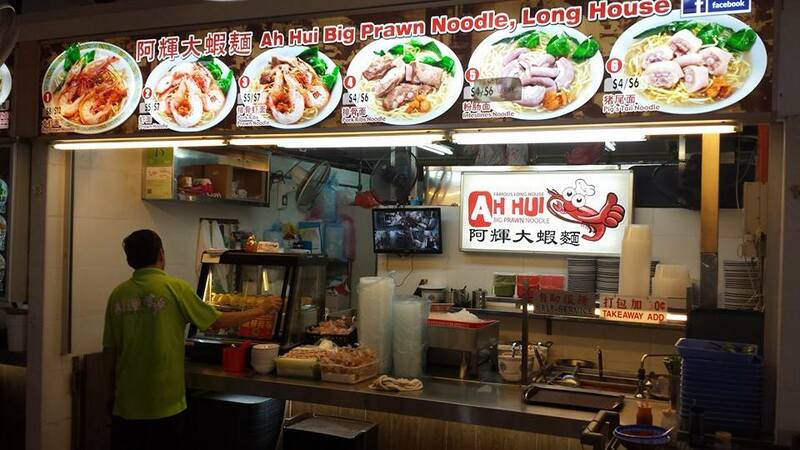 my close friend’s brother started a prawn noodle stall. he is much into cooking & did a very good chilli crab for my homecooked dinner previously. 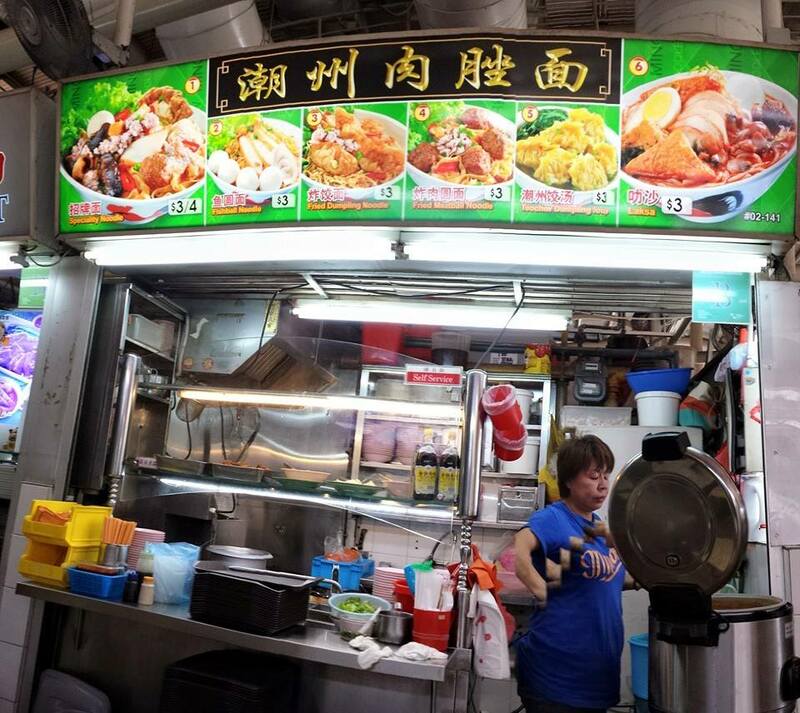 well, the defining thing for hawker fare is still the taste. 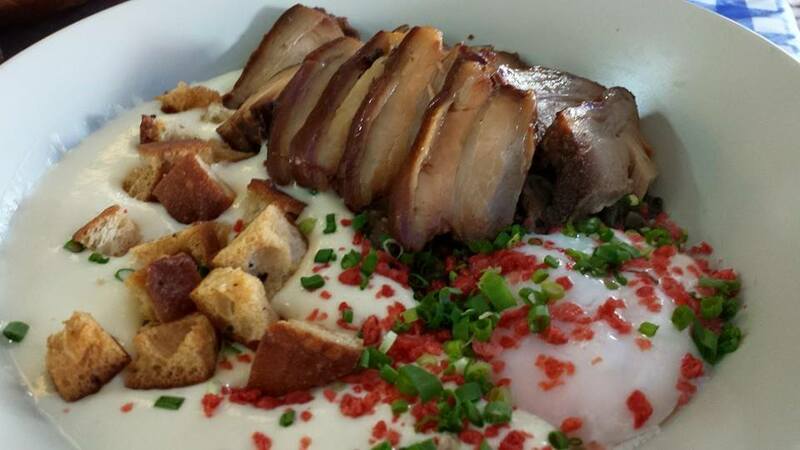 singaporeans will tolerate nazi chefs and travel to far corners of the island just for good food. 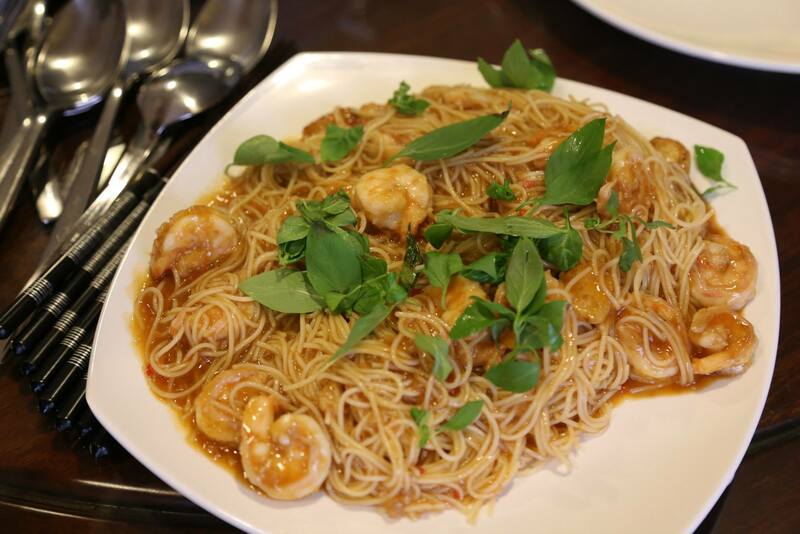 the noodles & beehoon were cooked just right with a good bite. tau gays still crunchy. 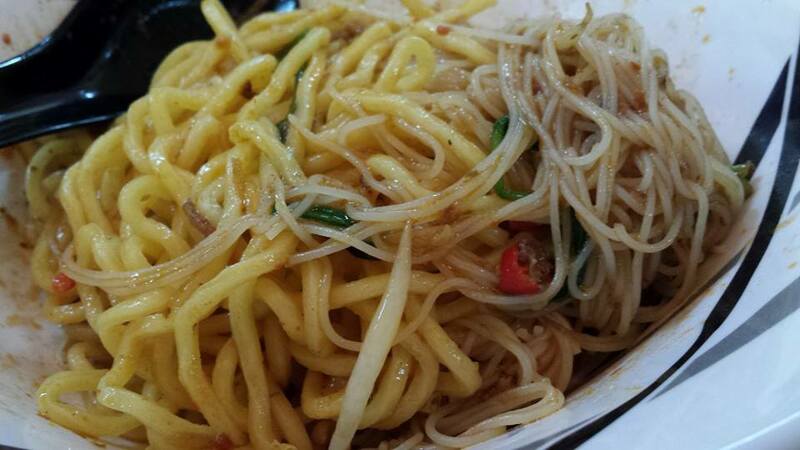 most of us though thought the quantity of noodles were a bit much. 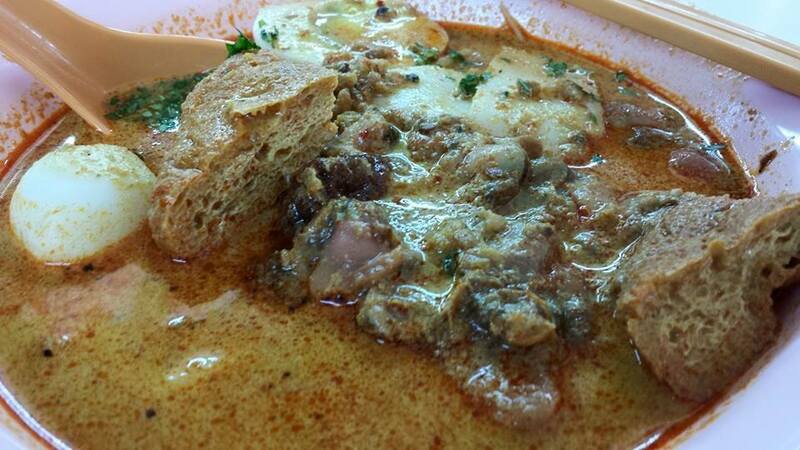 maybe it suits the canteen location, a good hearty meal to warm up to. but still i finished all the noodles, and usually i am a “low carb” guy, and 1/2 the amount of noodles would be too much for me already. the soup was flavourful & fairly intense. & one of the best things was the chilli. this really not easy to get right starting from scratch. but this a very good chilli (also the consensus among 10+ diners), 1 of the best i had. for me, the only place i had chilli better than this (& the soup was also more intense) was at wah kee at pek kio food centre, cambridge road. 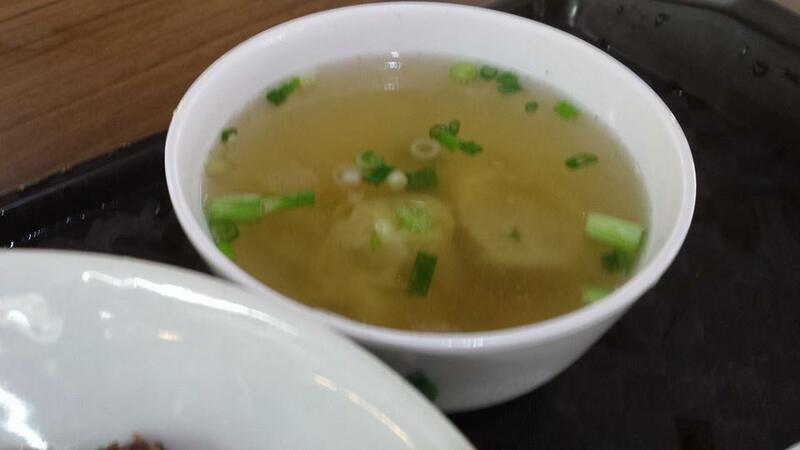 that again is subjective as some friends find wah kee’s soup a bit oily. i have not taken much of prawn noodles in the last many years, so i may not be the best person to talk about prawn noodles. 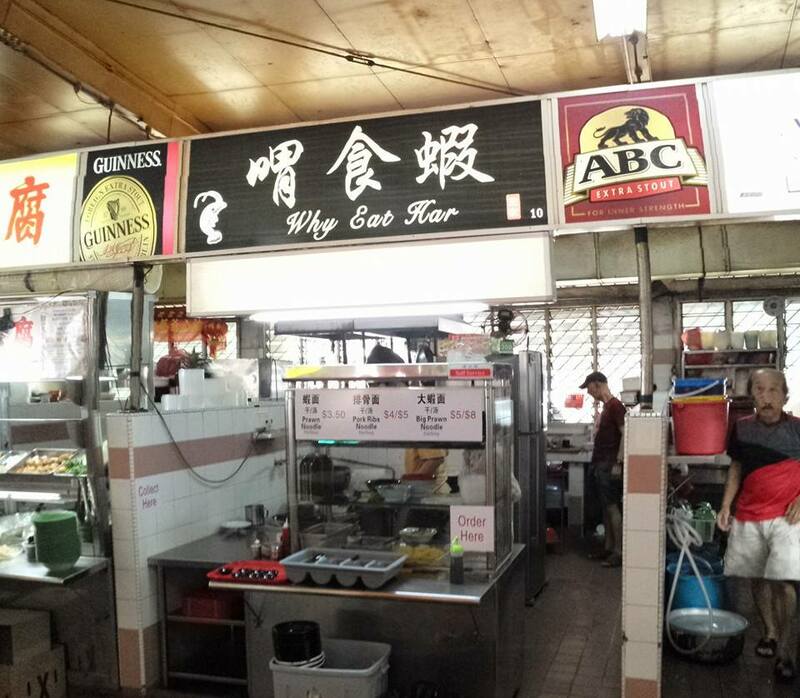 in the early days i liked the 人人 peoples’ prawn noodles at pasir panjang (i think it’s now in geylang but i have not tried that yet). then there is hoe nam at tai thong crescent which i also liked a while back. 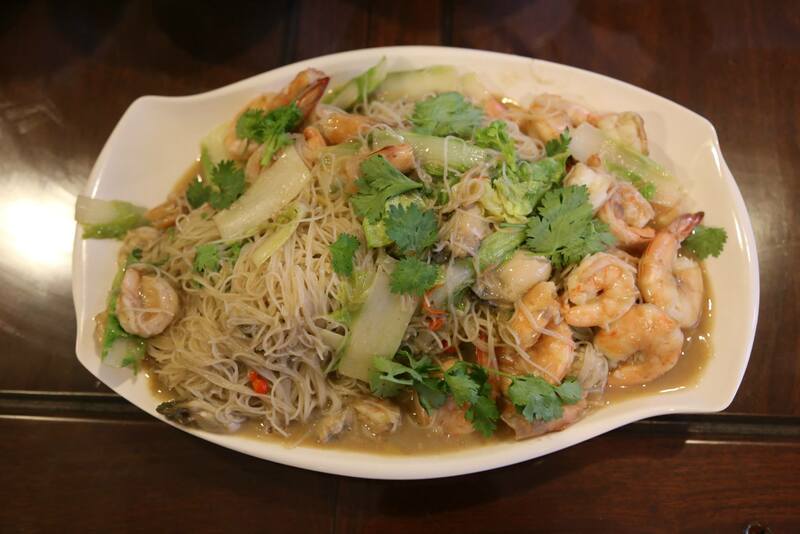 something a bit more recent (like 5 years back), i liked the noo cheng adam road prawn noodles at zion road food centre (not sure if it is still there). 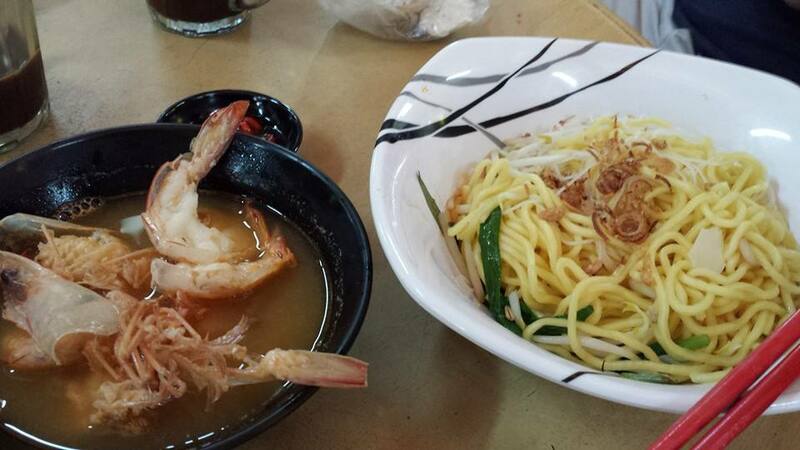 the noo cheng adam road prawn noodles at adam road food centre i find so-so. & there is the beach road prawn noodles everyone talked about( i thought at first that i had not tried it before but i think i had actually taken once >10 years back & it was quite good). back to Why Eat Har. 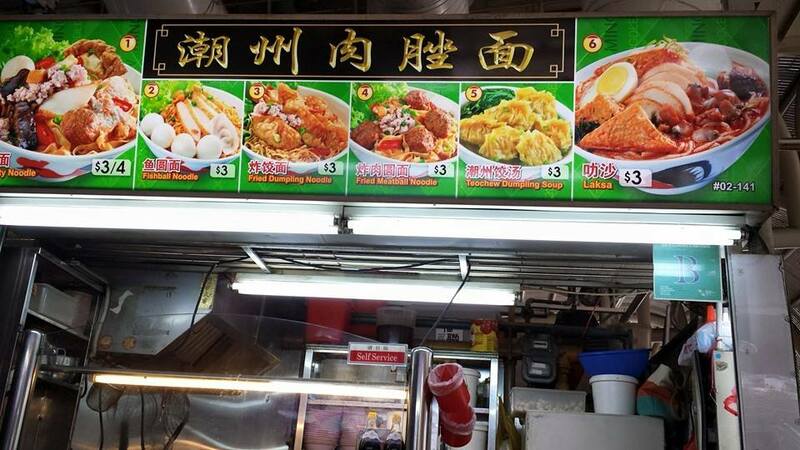 overall it was very enjoyable meal for S$5, and i must say among the best prawn noodles i have taken. i will go back & try again after a few weeks. let things settle down a bit. 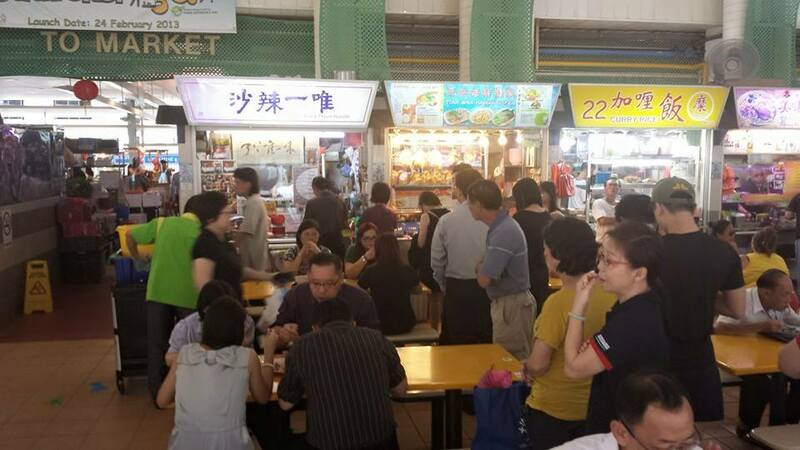 for myself, i find it a very formidable challenge to attempt this hawker stall thingy. first, it is such an incredible effort & time commitment. so much to do everyday from marketing, preparing the stock & other ingredients like pork rib, fish cake etc, cleaning up etc, & of course all the other issues in running a business. & you are competing with the best which are in business for 30 years, 50years. i cook a bit myself. just 2 days back i had friends over for a 9pax lunch & one of the dishes i cooked was a “hong lim FC curry chicken noodles”.